I ate Godeungeo Jorim regularly as a child. It was a staple in our home, probably because it was an easy dish for my busy mom to make on a weeknight. When she couldn’t find fresh mackerel at the store, she’d buy the ones in the can; it made cooking easier, since they were cooked anyway and all she needed to add was some vegetables and seasoning. Plus, she didn’t have to worry about tiny me swallowing bones. My mom noticed pretty early on that I loved eating fish, especially mackerel. She would carefully remove the bones and place a piece onto a spoonful of rice. I loved it when she did that for me. I’d clean out the entire bowl of rice and ask for seconds! One of my first introductions to South Asian cuisine was saag (cooked greens), specifically palak paneer (spinach with fresh cheese). I want to believe that my friend’s Indian parents made this for me because they were unsure of a tiny kid’s spice tolerance, but I have a feeling they made this dish because the flavors aren’t as bold. 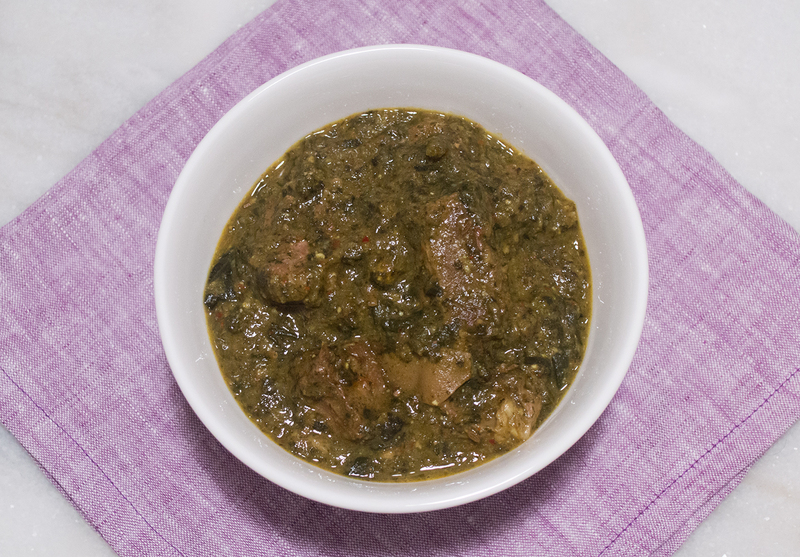 That isn’t to say that saag doesn’t have complexities, because it sure does; however, the amalgamation of the spinach (or other greens) and spices are more subtle. 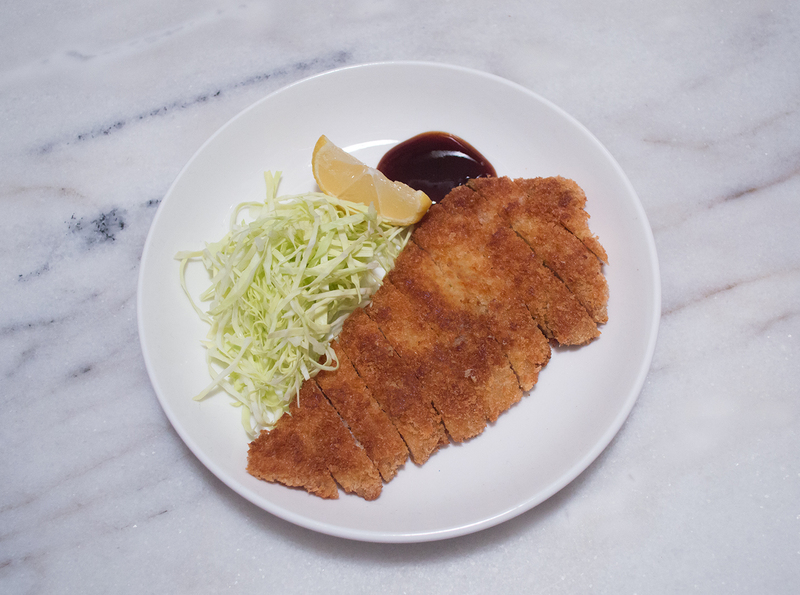 Tonkatsu (豚 – pig; カツ – from the word カツレツ, which is katsuretsu, transliterated from the English word “cutlet”; とんかつ), also known as dongaseu (돈가스/돈까스, derived from the Japanese word) in Korea, is something from a distant childhood memory. I feel like I was brought up eating this dish, however, I can’t pinpoint exactly when I first ate it. It’s possible that my mom or my grandma made it for me, or we first ate it at a restaurant; regardless of the “origin story”, I remember that I loved eating it! My first introduction to pineapple tarts was fairly recently. James had eaten them while growing up in Singapore, and said how difficult it was to find them here in the States. 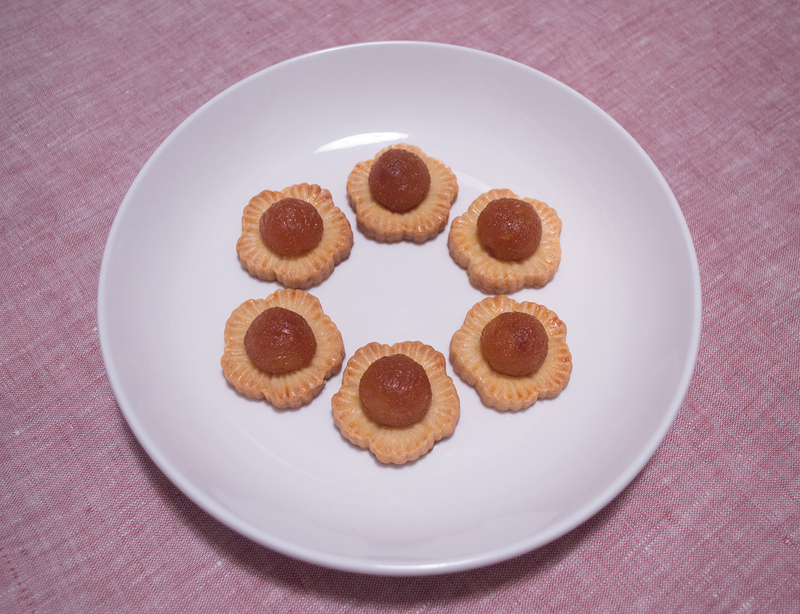 My only connection to pineapple tarts was pineapple cakes; the Taiwanese treats are easily available in Asian supermarkets, and my mom would buy them pretty regularly while I was growing up. When I found out that this was an entirely different pastry, I got really excited! If you have been following us from the beginning, you guys would know that anything with fruit is my jam!! Happy New Year, everybunny! We’re back from vacation, visiting friends and family on the west coast, and ready to cook! 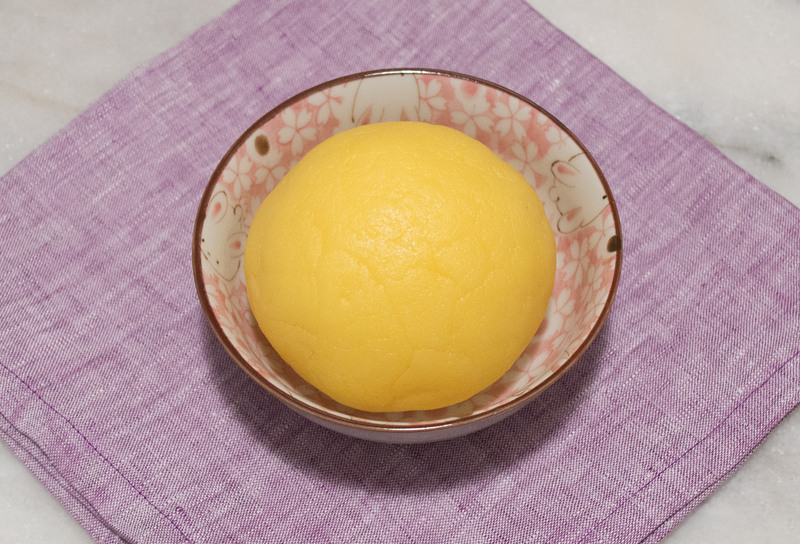 Quite fittingly, we’re making pineapple filling (fènglí xiàn – 鳳梨馅) for yummy pineapple tarts this week! It’s a treat that I wasn’t too familiar with until just a few years ago. Over the course of our relationship, Kitty and I have enjoyed sharing many many plates of dumplings, noodles, and fried rice. And the one constant in our life has been spice! Yeah, sure, maybe *that* kind of spice too (sorry, just being a bit cheeky), but I’m talking about chili. Chili oil, chili sauce, chili paste, dried chilis, roasted chilis, fresh chilis… we really love adding some heat to our food. Sometimes it’s a little, sometimes a lot, but we find that it breaks up the monotony of what’s on our plate, and it brightens things up. 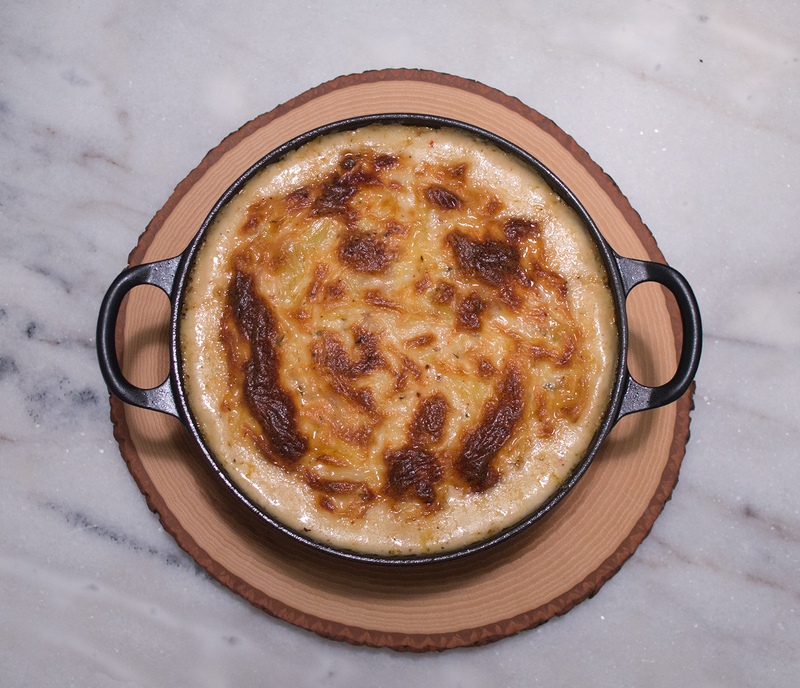 The first time I ate artichoke dip was when I was a freshman in University. At our campus coffee shop, they also prepared small plates, perfect for a quick lunch. I would sip on a soy chai, enjoy a soup in a bread bowl when I was feeling really hungry, or grab a spinach or artichoke dip when I had only an hour between classes. You could almost say that Kitty and I met over a bowl of artichoke dip! 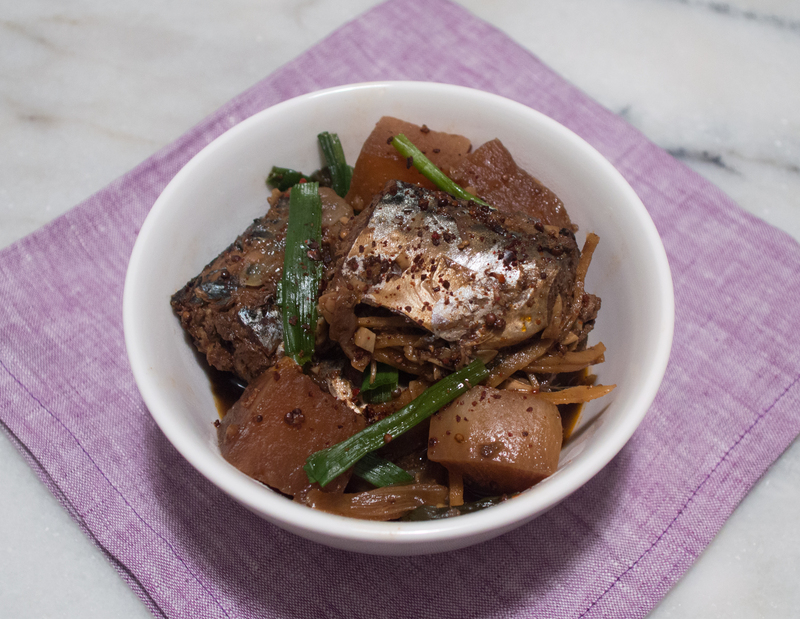 Like the regular goat stew we made before, the spicy goat version was something we collectively wanted to make at Everybunny HQ. 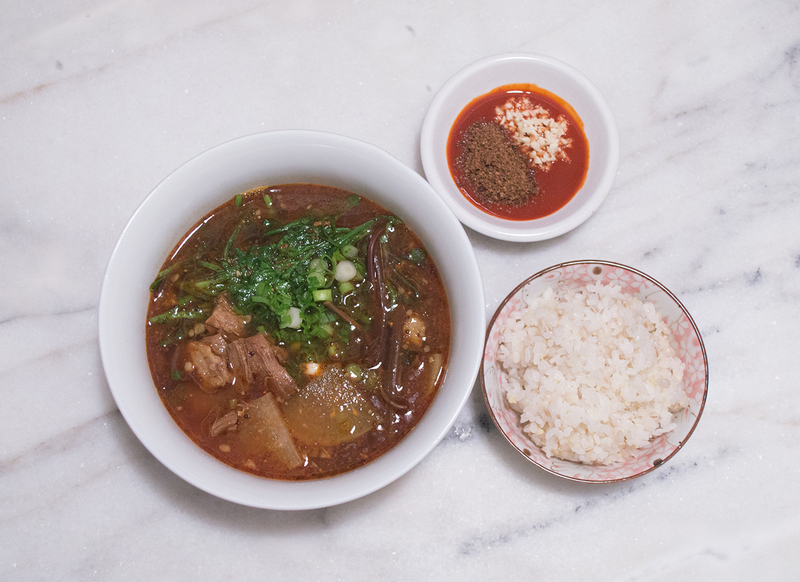 We love spicy food, and being that it’s similar to the beef brisket soup we shared with you last year, we knew the spicy goat stew would be just as delicious. Hi everyone! I’ve been battling tonsillitis the past two weeks, but now I’m fully mended. We wanted to share with you our version of Flaki, a traditional Polish tripe soup that is perfect for the coming colder months. It’s definitely helped me bounce back from being tired and having a sore throat. 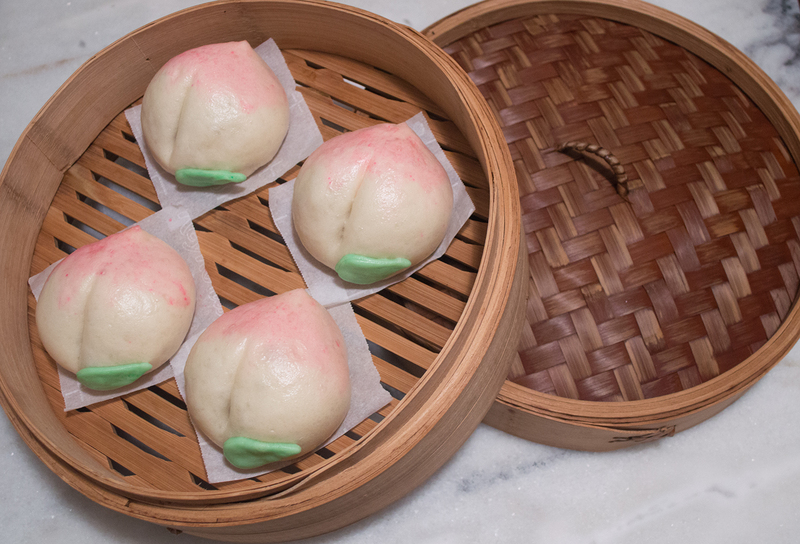 In true Chef Bunny fashion, we made some cute peach lotus steamed buns! It’s my birthday in a couple of weeks and it’s the perfect time to make these longevity buns. They’re named after the Peaches of Immortality from Chinese legends, which bestows a long life to those that consume the mystical fruit. 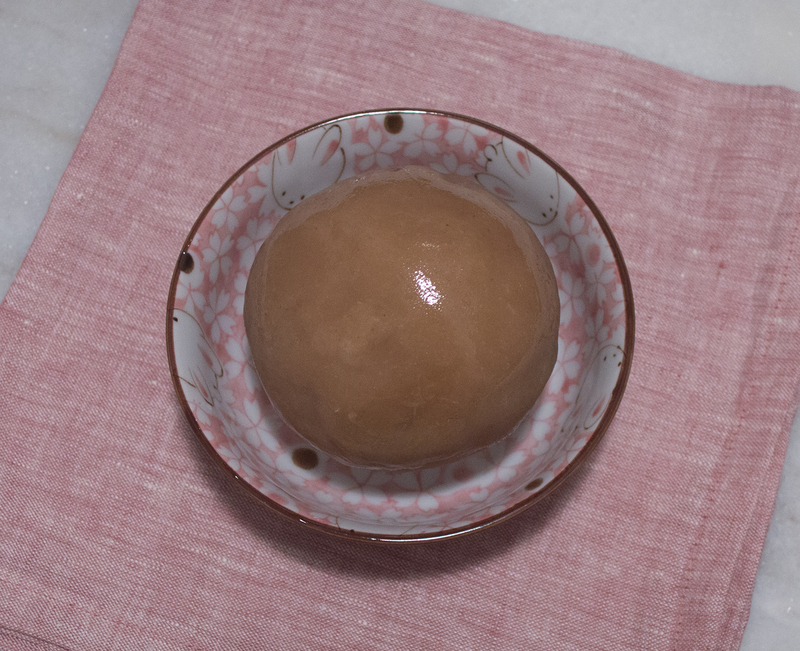 We had made some lotus paste for a mooncake project, and decided to make some more because I wanted to make steamed buns too! 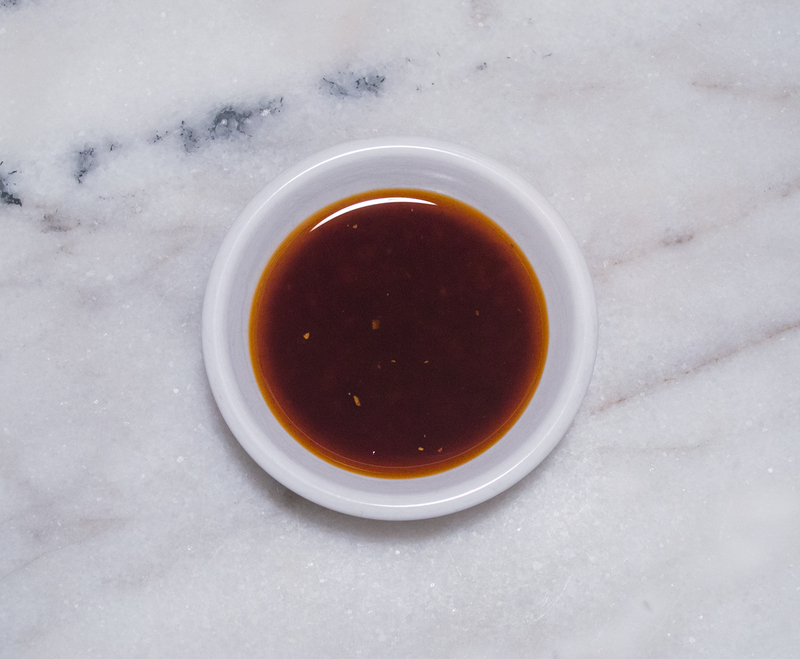 Much like red bean paste, white lotus paste is a popular filling for Chinese pastries and confections. 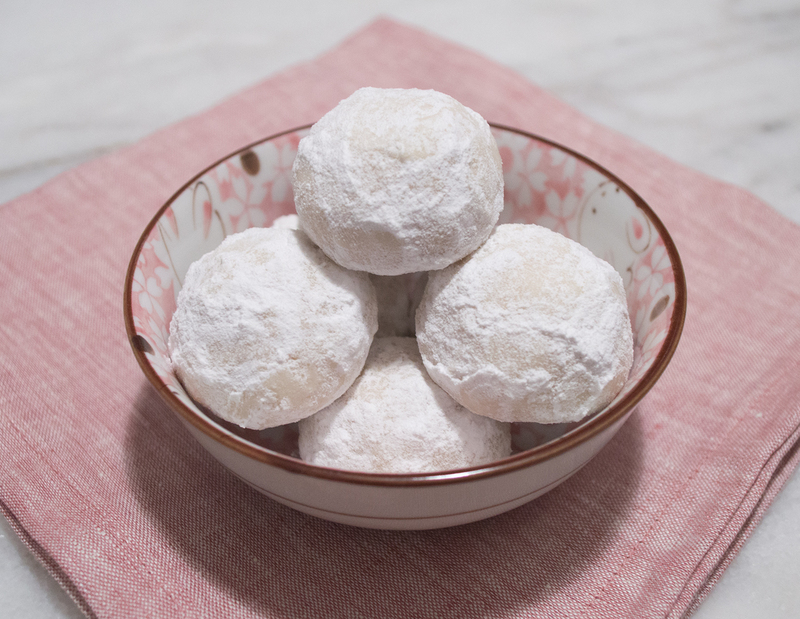 You often find them inside steamed buns, mooncakes, and filled rice cakes. 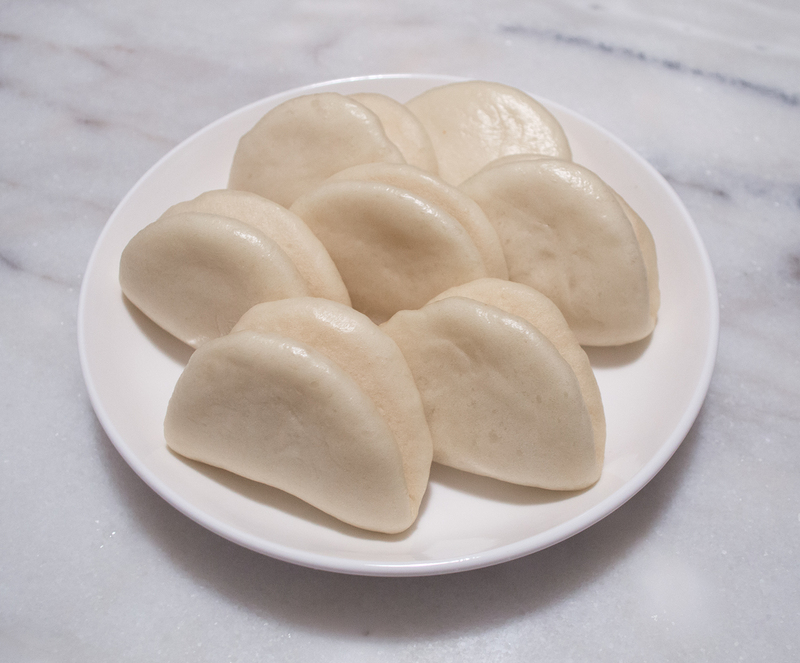 We enjoy making steamed buns with our fillings, and this is definitely on our list of things to make with the lotus paste! 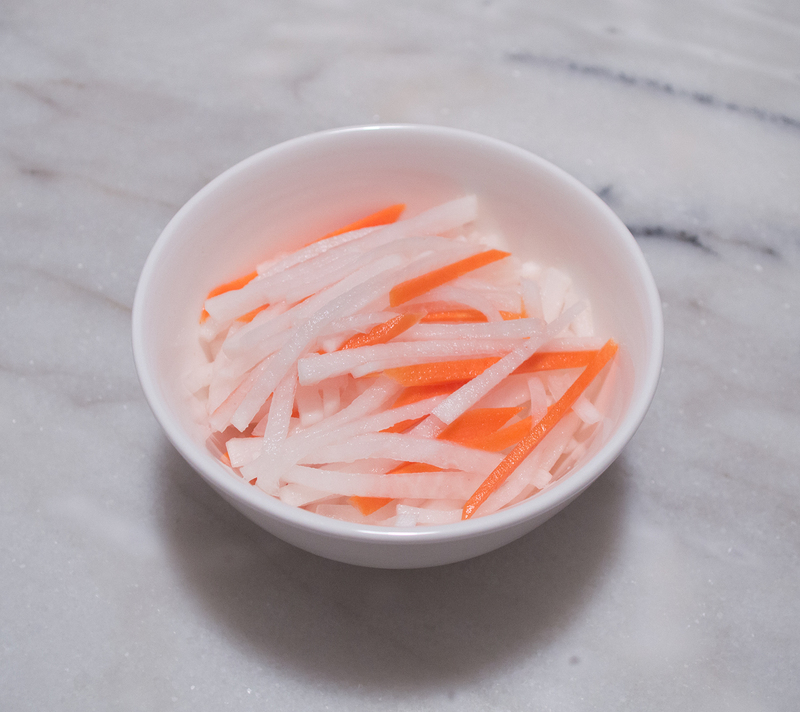 With every standard Korean meal, we have a variety of side dishes, called banchan (반찬), to enjoy with a bowl of rice. 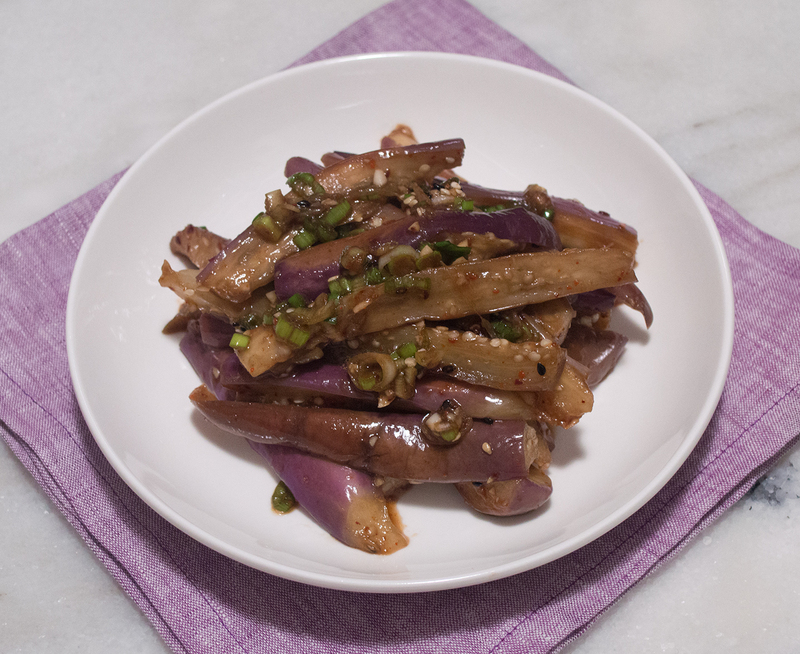 This seasoned eggplant dish is one of them, and is quite simple to make! My mom used to make this for us quite often, as it doesn’t take too much time. I’ve always loved eating this with all of the delicious seasoning. It marries so well together! 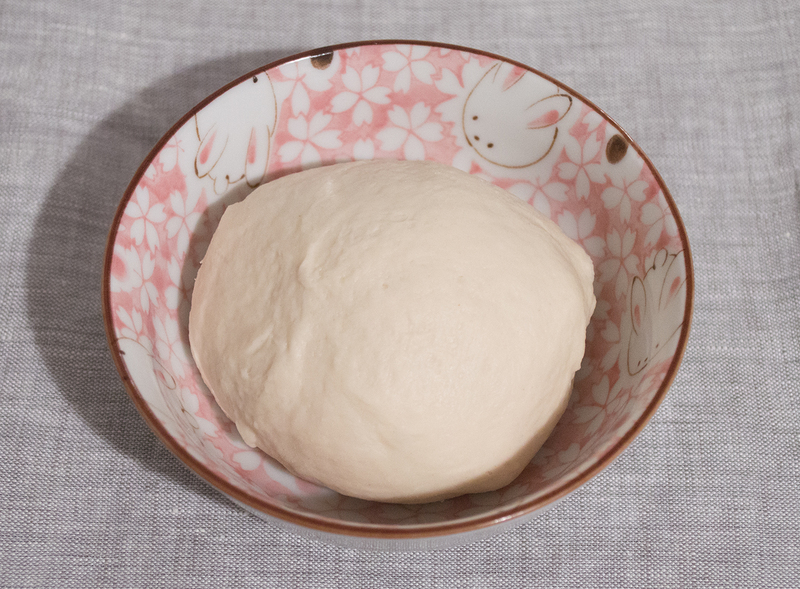 It’s been a couple weeks, but I have an excellent recipe to share with you this week! 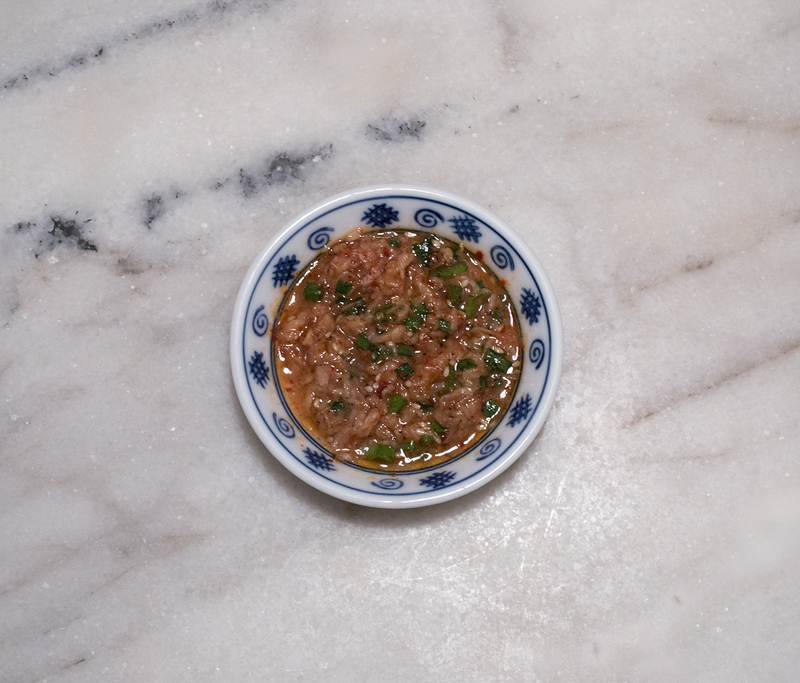 It’s a tonic of sorts, called Yeomso Tang, also known as Goat Stew. 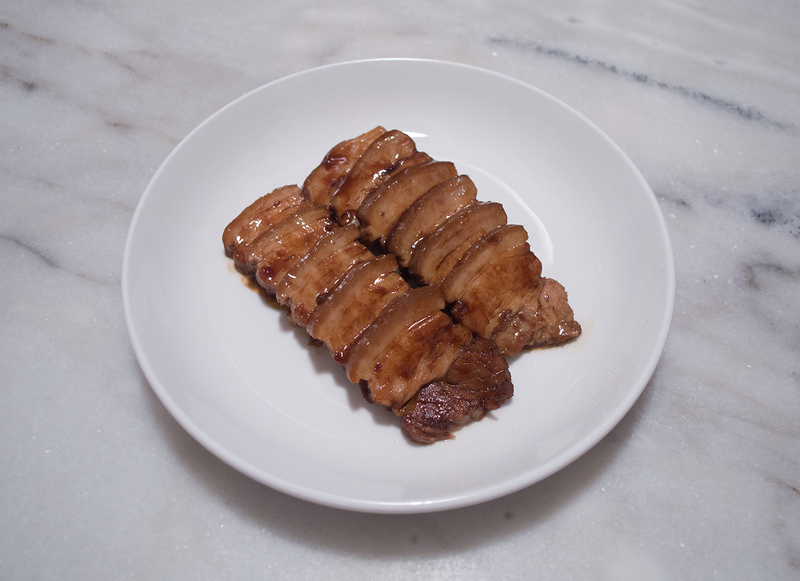 Goat meat is similar to beef brisket, in that it’s quite a tough cut to work with. It’s ideal for this kind of project, where the meat can sit and cook for a couple hours to make it more manageable. 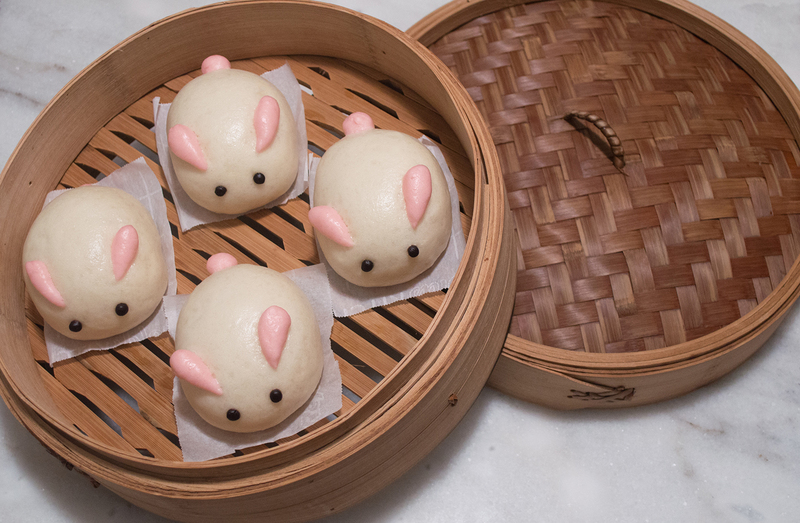 A couple of days ago, we shared with you our custard filling recipe, and we wanted to follow up with bunny-shaped custard steamed buns. BECAUSE BUNNIES! It just seemed the most logical, though we ate pig-shaped ones at our local dimsum restaurant. 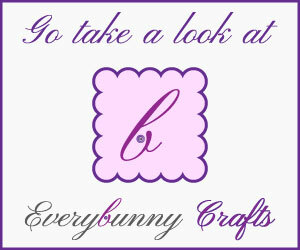 The pig ones are the most common, so I made some of those too; however, we’re partial to the bunnies over here at Everybunny Headquarters. 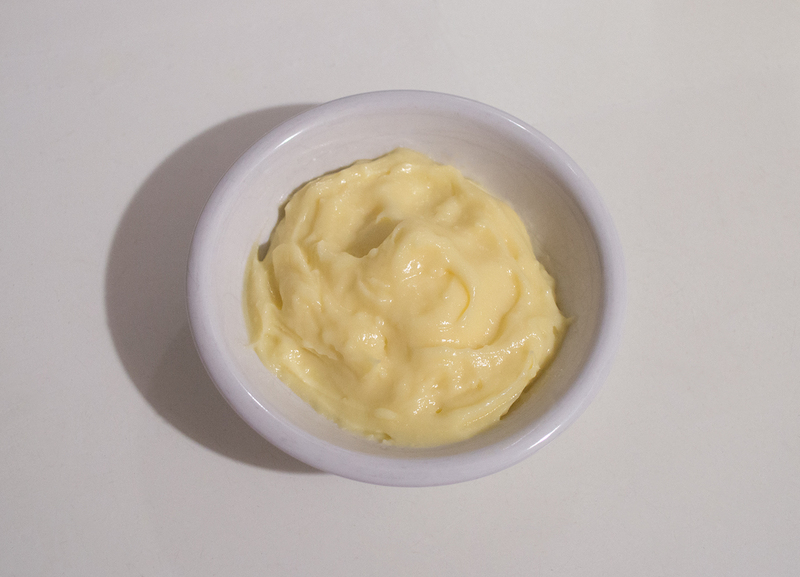 Kitty and I have been working on a great custard recipe for a few months now, trying to get a smooth product to share with you! We made lotus leaf and red bean steamed buns earlier this year and I really loved eating the cute pig-shaped ones here in the local Chinese restaurants for dimsum! They’re often filled with custard, so I just knew I had to try and re-create them at home with more custard filling, and with our delicious bun dough. It’s blueberry season, and that means baking some delicious sweets! 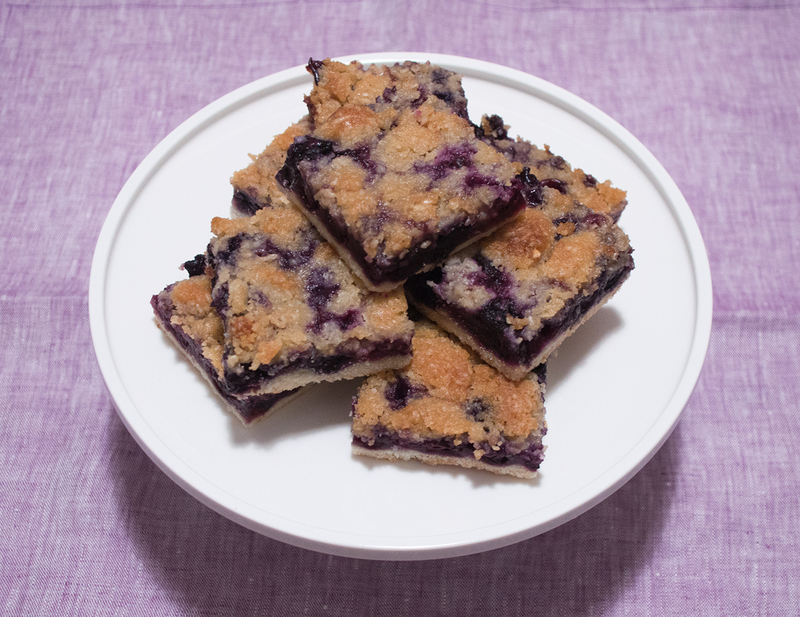 Blueberry crumble bars are what came to mind when I went picking for berries on Sauvie Island in Portland, Oregon. I went to go visit family and friends back in June to July, and had a great time one afternoon, picking raspberries, marionberries, and blueberries with a good friend and her kids. I had a great haul, with about 6 pounds of sweet blueberries to enjoy! Ojingeo Bokkeum (오징어 – squid; 볶음 – stir-fry) is a great dish to share, as it is often placed in the center of the table for everyone to enjoy. 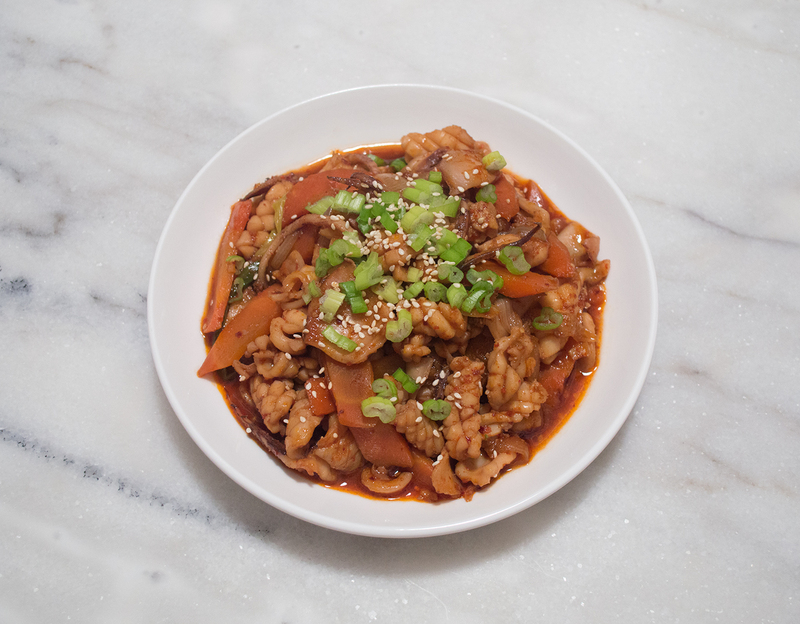 My mom would make this spicy squid dish pretty regularly, because my dad and I would deliciously devour it for dinner. Chonggak kimchi (총각 – bachelor; 김치 – kimchi) stems (haha, sorry) from the days when unmarried boys grew their hair long and wore it in a braid. When boys came into adulthood, their hair were brought up into topknots. These topknots looked a lot like these radishes, and their green shoots looked like pony tails, so the name stuck! James made me his version of Mexican wedding cakes when we were in college together. As a child, I ate something like this before, but I wouldn’t be able to place it to any specific time. I knew they were delicious then, and was excited to try his recipe. They were so amazing that we decided to make them a few times throughout our four years in school. 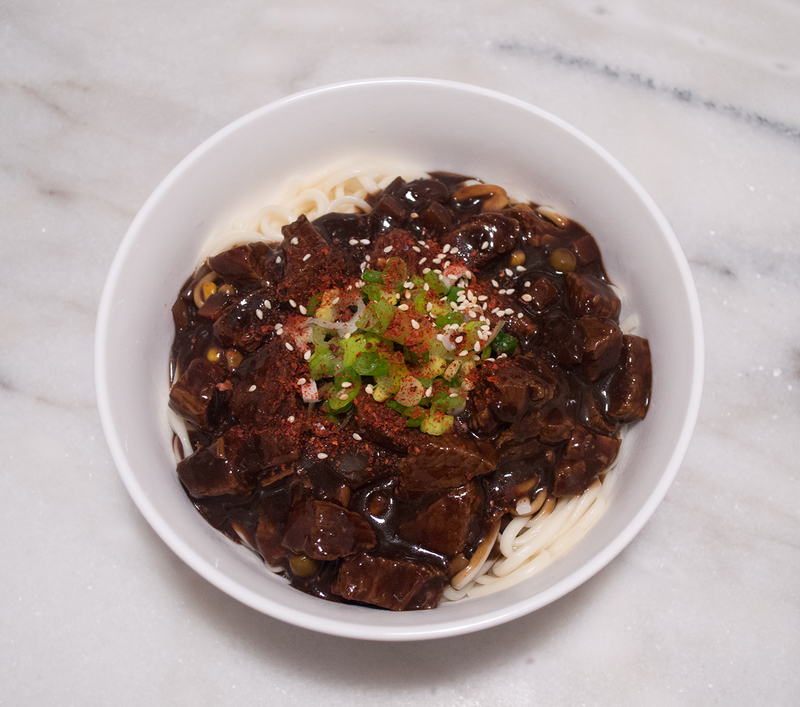 Jajangmyeon (자장면), also called jjajangmyeon (짜장면) from the word zhájiàng (炸酱 – “fried sauce”), is a Korean-Chinese noodle dish that is dear to my childhood. We often enjoyed a bowl of these noodles at the local restaurant, with plenty of sliced vinegared onions and pickled radish (danmuji – 단무지). 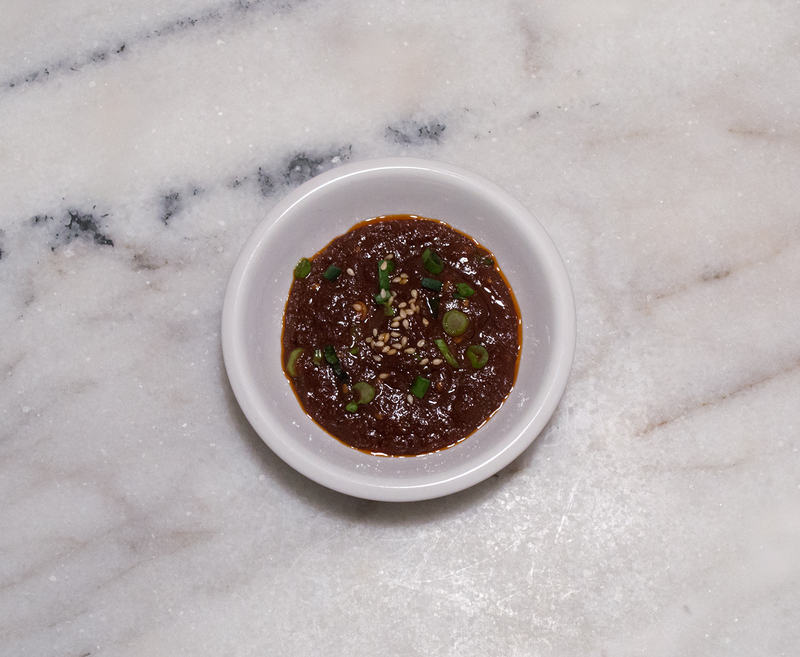 Our servers would always give us a plate of kimchi with our meal too, knowing how it’s nice to have a spicy side dish with something so savory. 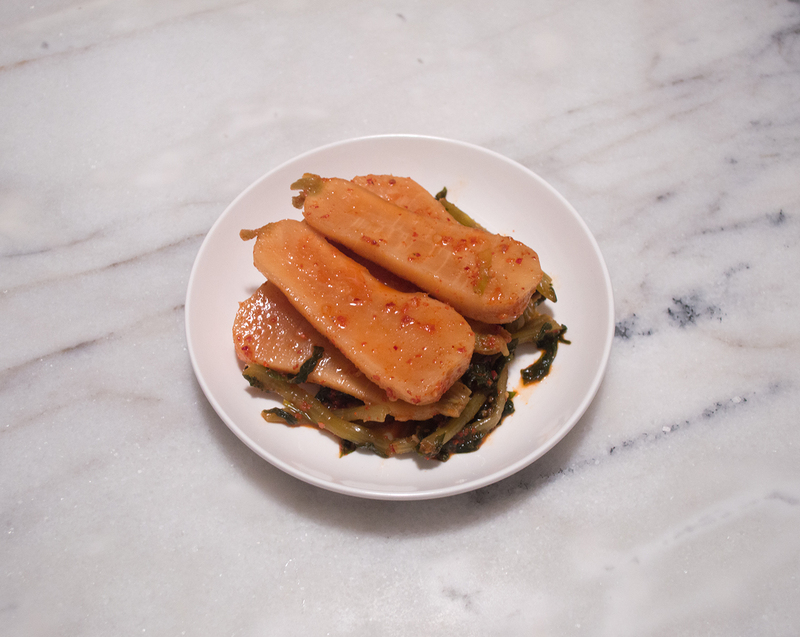 Nabak Kimchi comes from the phrase “nabak nabak“, which is to “make something flat”. 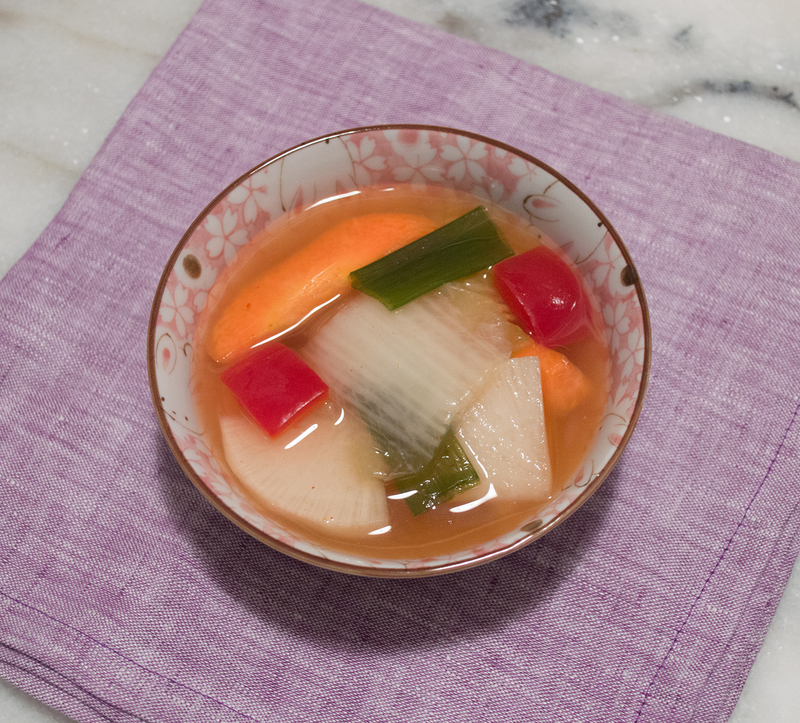 I grew up calling this side dish water kimchi, because it was the only water kimchi I knew (apart from dongchimi, which I had already known the name for, and wouldn’t get confused)! It was only later that I discovered this dish actually had a proper name. 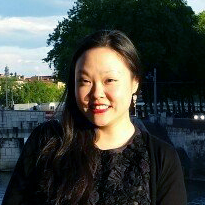 Feeling foolish, I also discovered my beloved “instant kimchi” had a proper name as well! It was from this point on that I wanted to really know how to make nabak kimchi. The first time I saw my mom make whole cabbage kimchi (포기 – whole head of cabbage; 김치 – kimchi), I was amazed by the sheer number of cabbages rolling out of the crate. It was a crazy feat every autumn; buying a 50-pound box full of cabbages at the end of the harvest season, brining it all in a large icebox in our utility room, and making kimchi to last us four to five months. We’d chip away at it by making soups and stews, mostly, with an occasional weekend lunch with pancakes or fried rice. 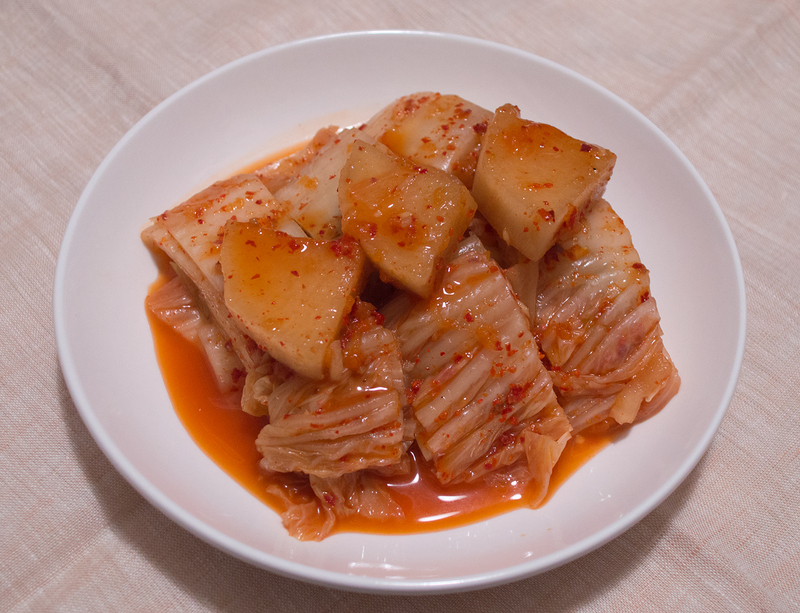 It was something that I always remembered and enjoyed because whole cabbage kimchi tasted tremendously better than regular simple cabbage kimchi. Don’t get me wrong, the simple version is great too, but the depth of flavor in a whole cabbage version is hard to beat. 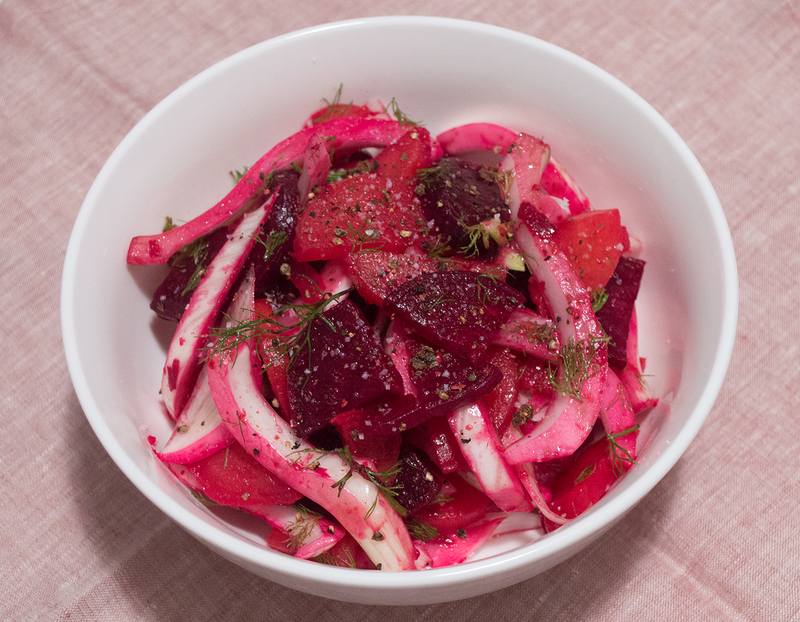 Earlier this year, we made this refreshing and crunchy beet and fennel salad for Valentine’s Day. We don’t make this as often as we want to, for fear that we would get tired of it. Honestly, we probably wouldn’t, though it’s always nice to have something extra delicious on special days like *Love Day*. I love everything that has to do with mushrooms! I enjoy eating them in soups, stir-fries, and sauces, and also love them grilled, oven-roasted, and fresh in a salad. It seemed like the next logical step was to make mushroom pancakes with them, because I wanted a good side dish to make for dinner. Red bean steamed buns are straight out of my childhood. My parents used to feed these to us every morning, as they were easy, convenient, and a warm meal for two sleepy kids rushing out of the house to go to school. We never imagined to make them at home because they were fairly inexpensive at the Korean market. I wasn’t too interested in making them myself until I realized the store-bought ones were under-filled. 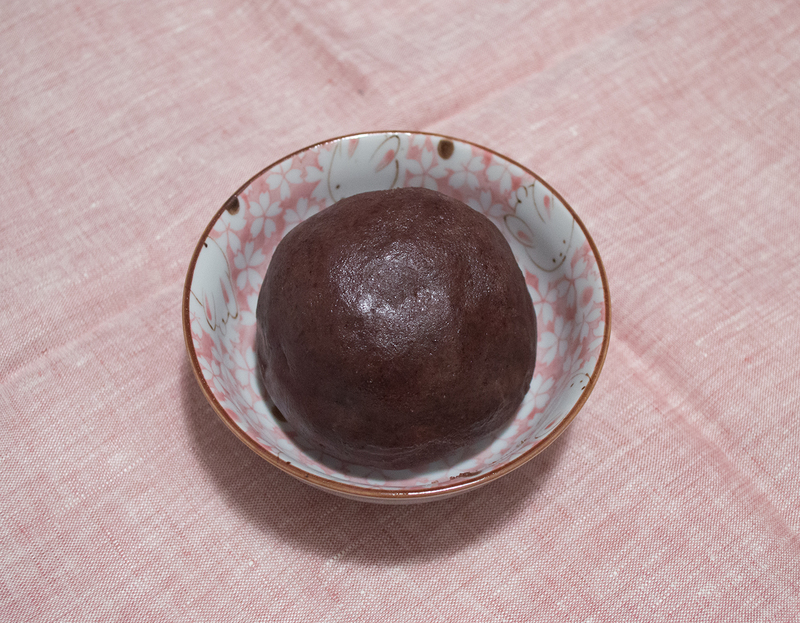 When I was working on my taro buns, I decided that I should test out different flavored buns as well, so naturally, I decided to make the popular red bean version. 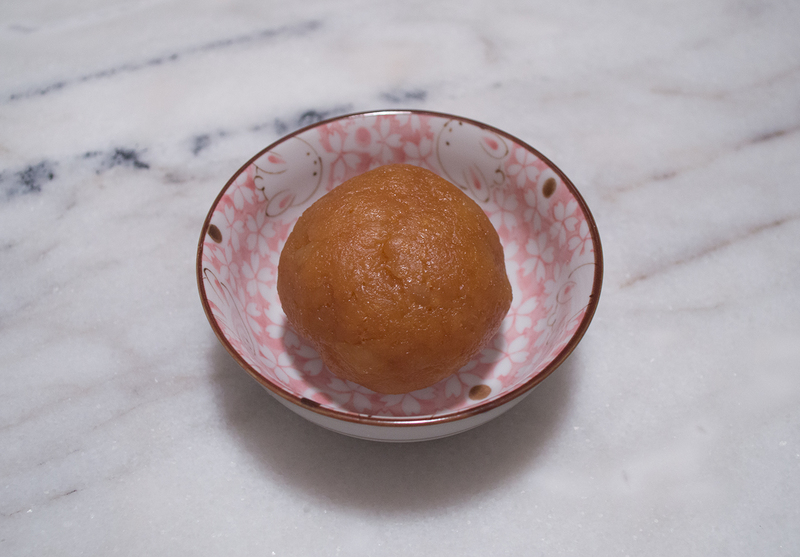 Red Bean Paste, also known as hóngdòushā (紅豆沙) in Mandarin, danpatso (단팥소 – “sweet bean filling”) in Korean, and azukian [小豆餡 – “small bean (adzuki) paste”] in Japanese, is a mash of beans that is often used in sweet soups and pastries. It comes in a variety of textures, from chunky, to smooth, and some pastes made somewhere in the middle. My favorite summer desserts made with red bean are cold desserts, like patbingsu and anmitsu, because they’re often mixed with fruit. In the winter, I always go for a steamed bun! We’re continuing our Korea series, coming into the final stretch of our trip! We have eaten a lot of really good meals on this adventure, and plenty of street snacks. 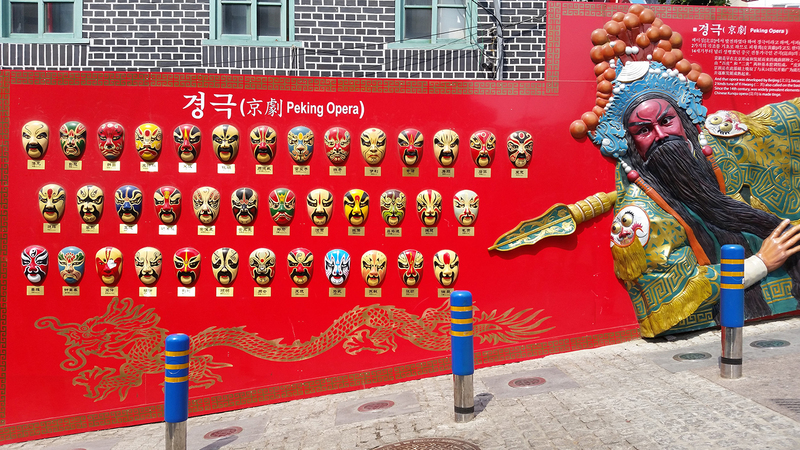 Our last few days were busy, eating pastries around Hongdae; visiting the city of Paju, going on a tour there, and then spending the rest of the day with family; checking out the Incheon Chinatown and eating at the famous Chinese restaurant; and exploring, very briefly, the area of Gangnam. If you’re joining us now, you’ll see that Bunny and Kitty have been all over Seoul and the outer metropolitan areas. You’re welcome to come up to speed by checking out our previous posts on our food adventures in Korea! 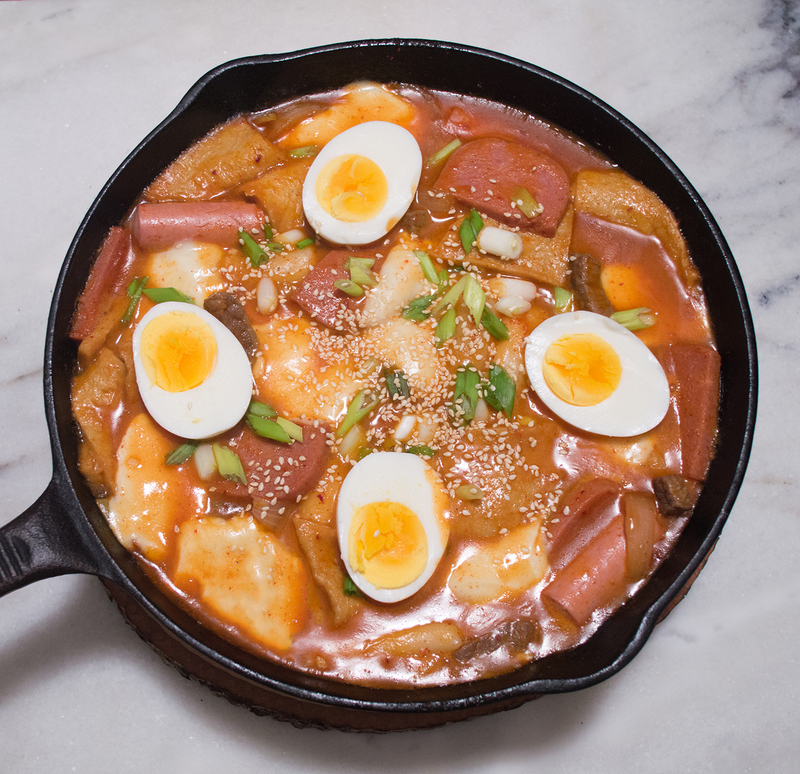 If you read our post on Rabokki, you’ll know that I grew up eating Tteokbokki (떡볶이) at home. 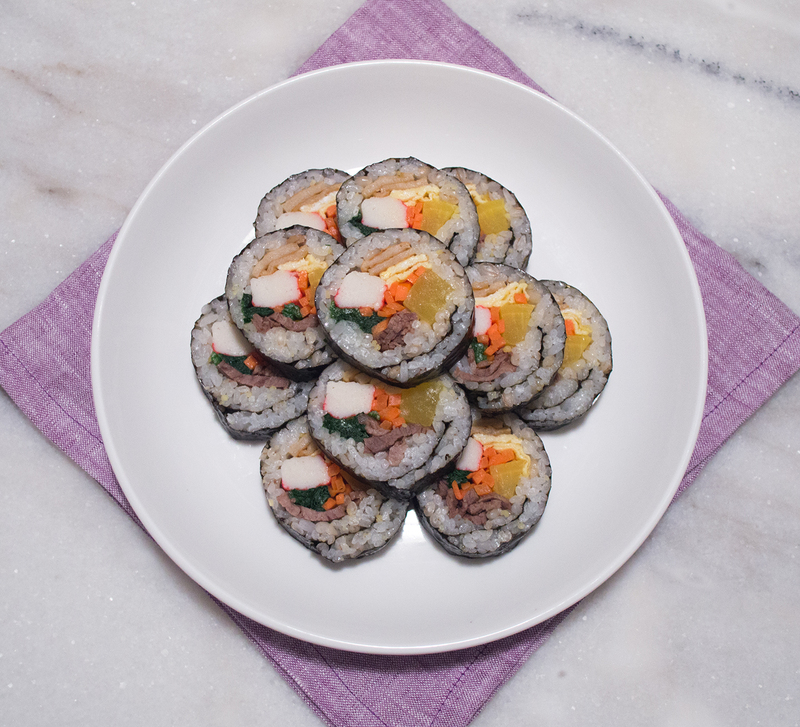 We wanted to showcase this rice cake dish differently, and enhance it to something a little fancier. It’s delicious on its own, as a bowl of rice cakes swimming in spicy sauce, but we wanted to have some fun with it by adding mozzarella cheese! 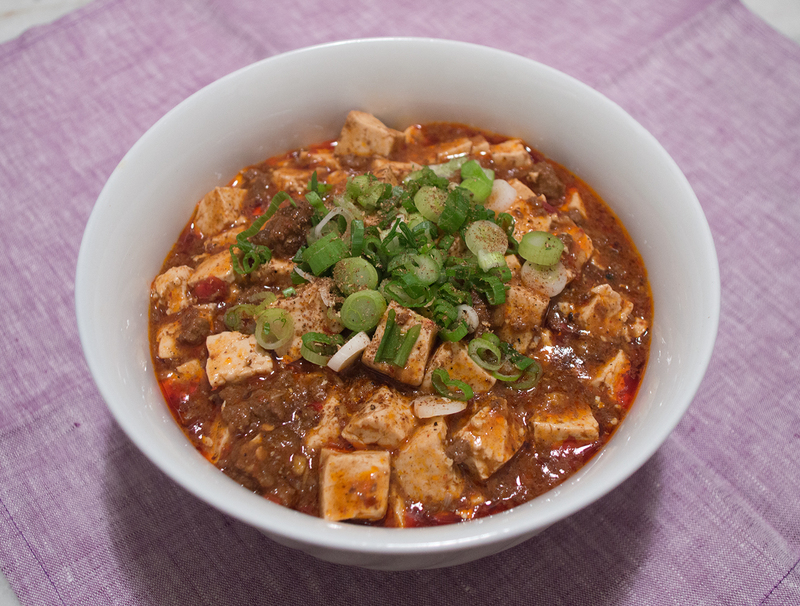 Mapo Tofu is a favorite at Everybunny Headquarters! It’s especially wonderful this time of year, when the weather is cold and we need something hot and spicy to warm our tummies. Both Kitty and I were underwhelmed when we ate mapo tofu at a bunch of different restaurants around the City. One place had watery sauce, another restaurant had little to no meat, and another had such mild spice, we wondered if it was really mapo tofu. We decided that we needed to make our own. Golbaengi (골뱅이) are small sea snails that are found all over the world. They’re delicious in soups and side dishes, and excellent when grilled. These shellfish have a chewy texture, with the natural sweetness its charm. I didn’t eat them too much when I was a child, but as I got older, they were definitely making more appearances on our kitchen table. My love for shellfish has no bounds. My mom has always told me that I am my father’s daughter. He grew up on an island in Korea, and had an abundant source of seafood, living minutes from the shore. My guess is that Mom wanted to find some easy dishes to make for him, other than fish, and this was one of them. This also meant that I would be delightfully eating them too! 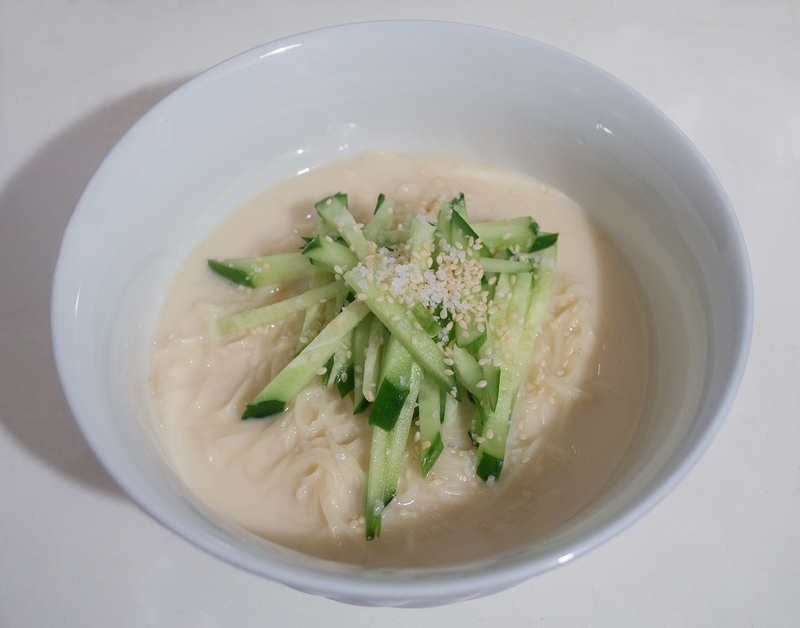 I have eaten kong guksu (콩 – bean, 국수 – noodle) since I was very little, but didn’t appreciate it until I was older. I went on a family trip to Korea during the summer of 2001, the year they opened the Incheon International Airport. I remember that we stayed with relatives for almost a month, much of it spent with my grandma in Ganghwa. It was a year after my grandpa died, and it only felt right to go and visit everyone. Growing up, my mom never made lotus root for us at home. If she did, I don’t remember. It’s not really her fault. I think it’s because the convenience of cooking other vegetables was more appealing to her. We ate a lot of greens, sprouts, soups, and stews, and the requisite kimchi. We felt like we weren’t missing out at all. As a little kid, I didn’t know what a lotus root looked like, so I never searched for it on our grocery trips. In fact, I hadn’t seen what one looked like until I was in middle school, looking through a book of botanical illustrations. They looked strange to me, all bulbous and holey. How can something like this be edible? Choux à la crème, otherwise known as choux pastries or cream puffs, are perfectly compact gems filled with luxuriously smooth cream that dessert lovers indulge in buying for themselves (and their loved ones). I certainly enjoy eating them, as they are so versatile in flavor and texture, and often sport a bit of whimsy. I made these for Thanksgiving one year because I wasn’t quite sure what to make for a large family gathering; these seemed to fit the bill because they’re individually sized, and we could choose to have seconds without too much guilt! The idea of making our own braised pork belly buns happened right after we ate some at a local restaurant. A number of years ago, we came upon a store that specialized in steamed buns. We tried it out, and they ended up being really good that we had to be repeat customers. It’s been a couple of years since they closed their shop, but we still remember their tasty steamed buns. This seems to happen to us time and again; we find a hidden gem in the City, eat their delicious food for a year or two, and then soon find that they have closed forever. As sad as this is, it leads us to making our own version in the kitchen! 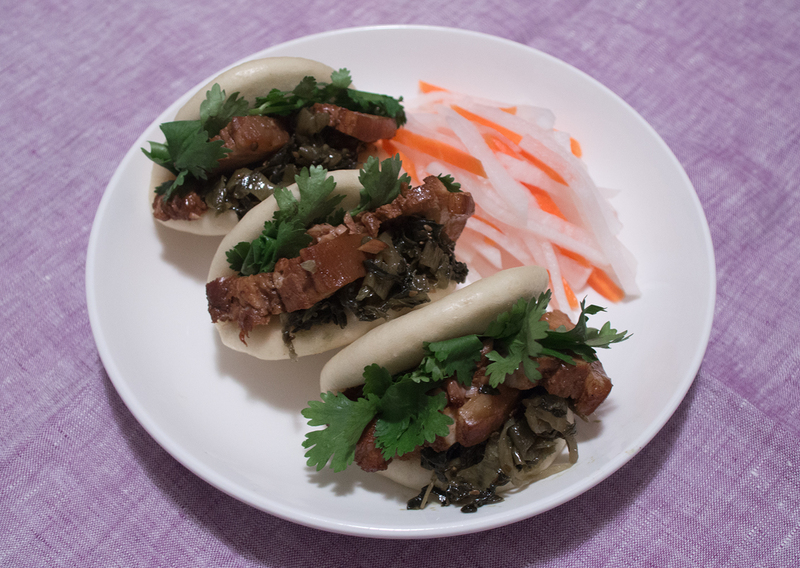 Here’s the last entry of our pork belly bun series, the lotus leaf buns! These are shaped like leaves, and flattened for the purpose of stuffing like a sandwich. James has made a ton of steamed buns with me over the past year, trying to help me get the recipe right. We’re excited to share this with all of you guys, so that you can enjoy pork belly buns at home too! 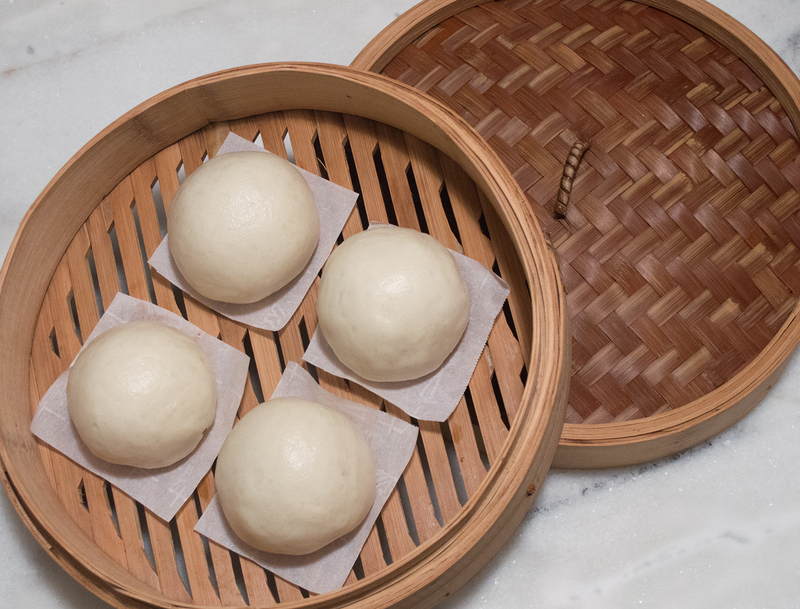 When I was growing up, I used to eat a steamed bun for breakfast almost every day. It was the perfect size for my little hands to hold and eat, while getting ready for school. Slightly chewy and super fluffy, I always wondered if I would be able to make my own one day, just as good as the ones from the store. 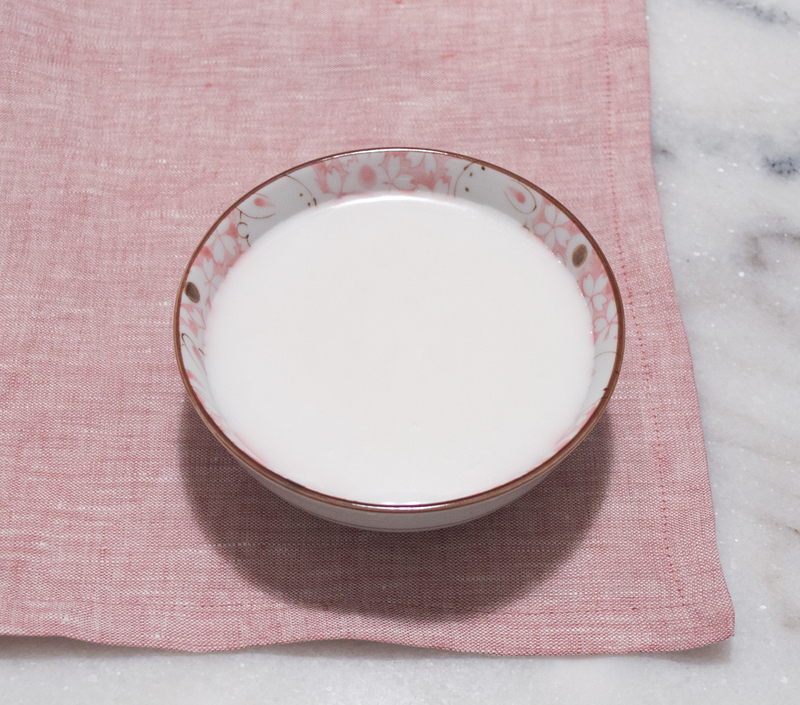 We love soy milk here at Everybunny HQ, and making it at home has been so easy! We considered buying ourselves a soy milk maker, but knowing that we have all the tools we need at home to make soy milk, we decided against it. It turns out creamy and smooth, with a stronger soybean flavor that makes it super nutty. Pork belly is glorious! I love how succulent the meat can be, due to the fat content. It’s delicious when it’s braised, like the way it is done in this recipe, because the herbs and spices get absorbed into all of the layers. James and I worked on this recipe for awhile, so we could make sure this tastes great! Kitty and I enjoy eating radish and carrot slaw as a side dish for days we don’t want to fuss too much in the kitchen. It’s easy to make, and great with meaty dishes, like our pork belly buns! I find that having it chill in the fridge gives this salad the extra zip and snap; it’s even better if you have it sit overnight! It’s here! our Pâte à Choux has been revamped and retested to make sure they’re perfect for delicious pastry cream! I made these for Thanksgiving last year, and they were a hit with my relatives. 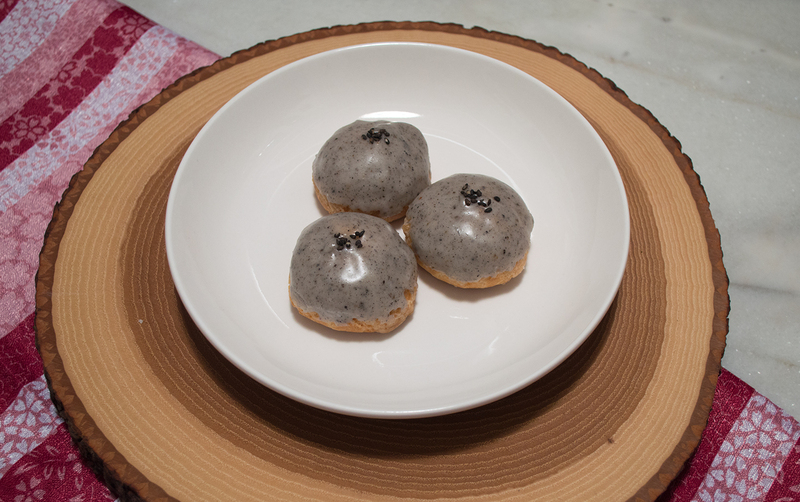 I assembled a few dozen cream puffs filled with black sesame pastry cream, and they were devoured within the hour. It was quite obvious then that I would have to post it here for everyone to enjoy! 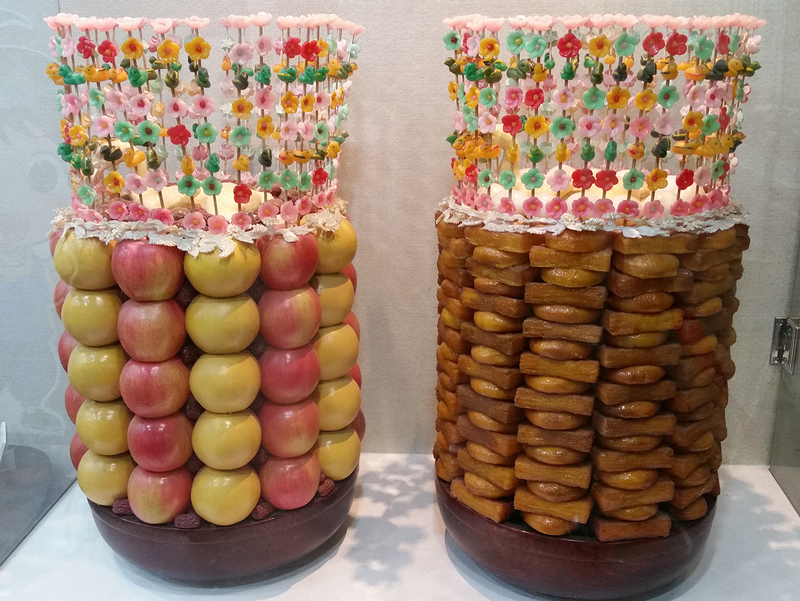 On this trip into Seoul, we visited the Rice Cake Museum (떡박물관) and Insadong (인사동). If you’re joining us now, you’ll see that Bunny and Kitty have been all over Seoul and the outer metropolitan areas. You’re welcome to come up to speed by checking out our previous posts on our food adventures in Korea! 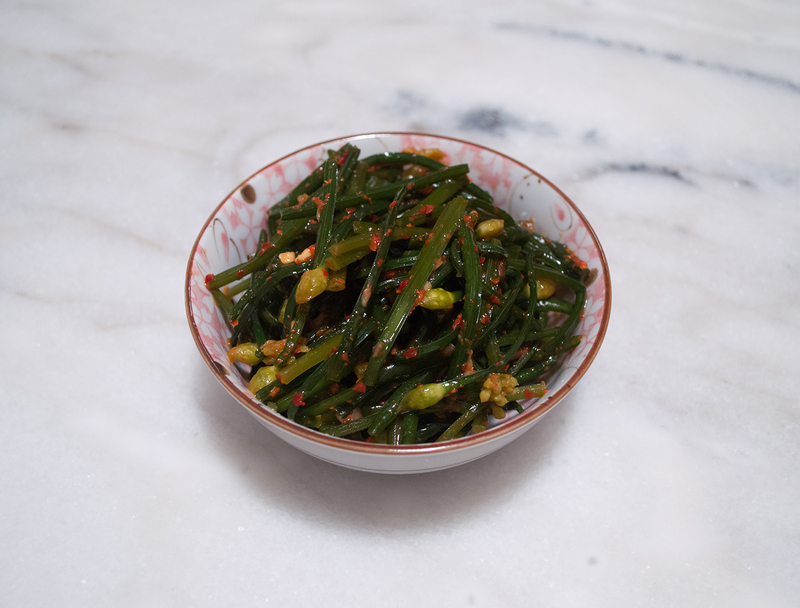 James loves garlic chives (부추 – buchu). He has been talking about it quietly and subtly for the past decade, wondering when I would be making it into kimchi for him. I didn’t realize how much he enjoyed eating the stuff until we were dining at a Korean restaurant one day; in addition to many of the banchan (반찬 – side dishes), he couldn’t stop eating the chives that came with our meal. 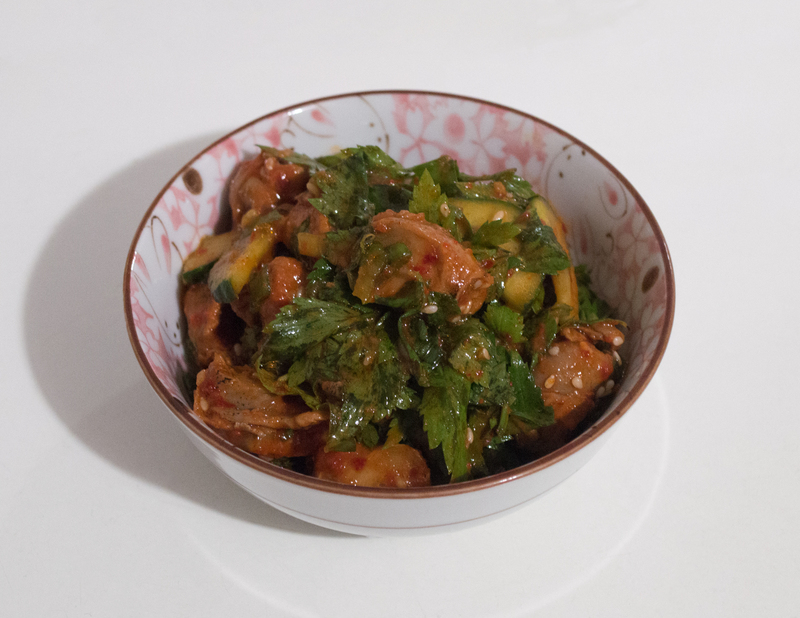 Quite some time passed before I decided to make this kimchi at home. I think it wasn’t because I didn’t know how. It’s probably because regular kimchi or radish kimchi were just the first choice of all the staple Korean side dishes out there. Hi, everybunny! We’re back to our *Adventures in Korea* series! 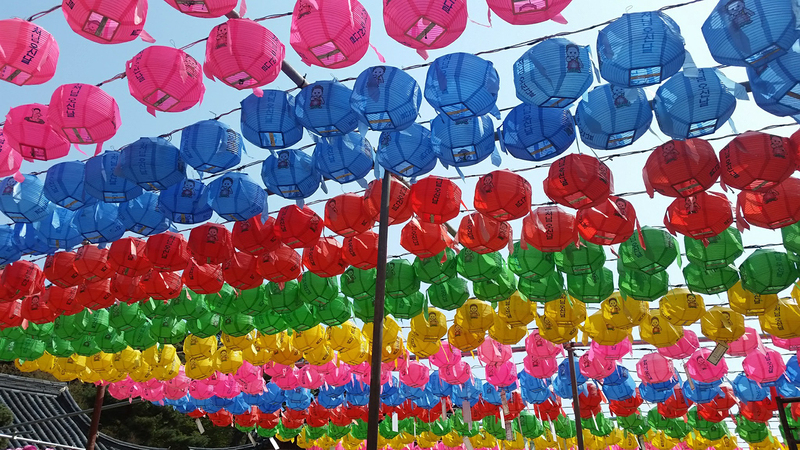 In our first post, we were on the island of Ganghwa, and a few days later we moved towards Seoul. 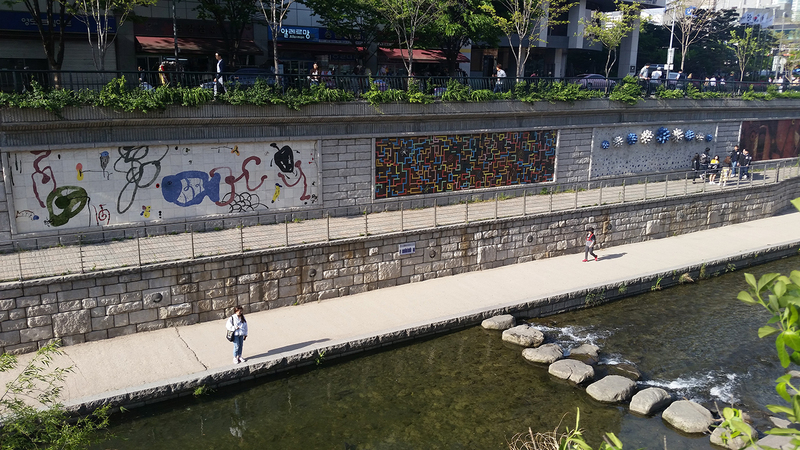 The second and third posts showed us exploring Dongdaemun and Namdaemun. 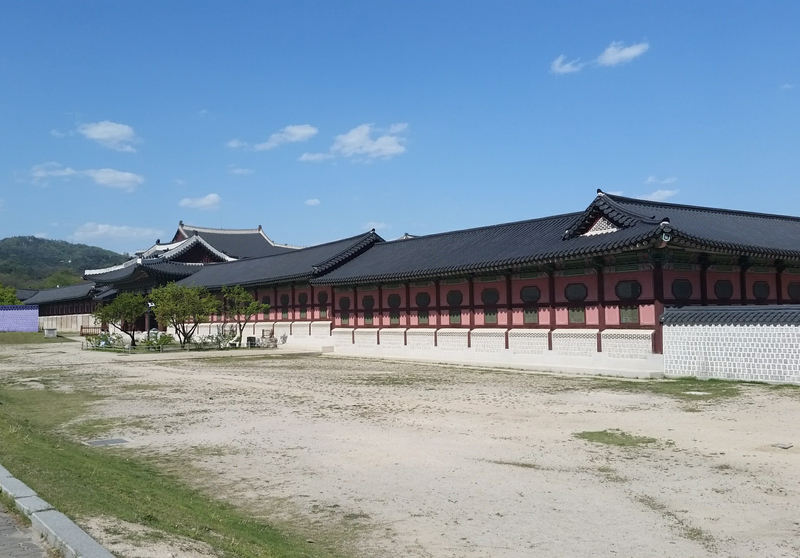 The next part of our vacation took us to the palace grounds of Gyeongbokgung (경복궁). 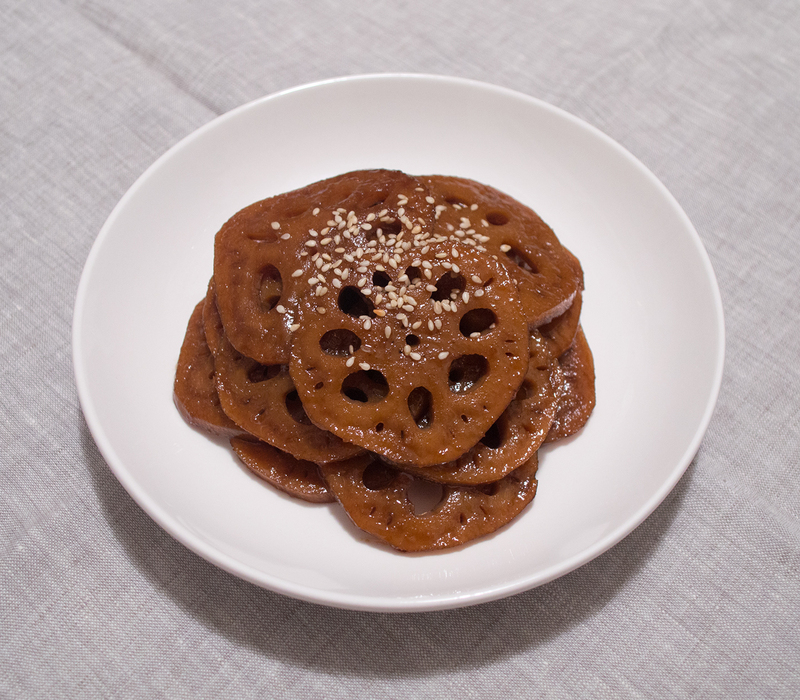 Yaksik or Yakbap (약식/약밥; also spelled Yakshik), is a traditional rice cake from Korea. It translates to *medicinal food* or *medicinal rice*, since honey, a key ingredient in classic yaksik, was considered a kind of medicine. 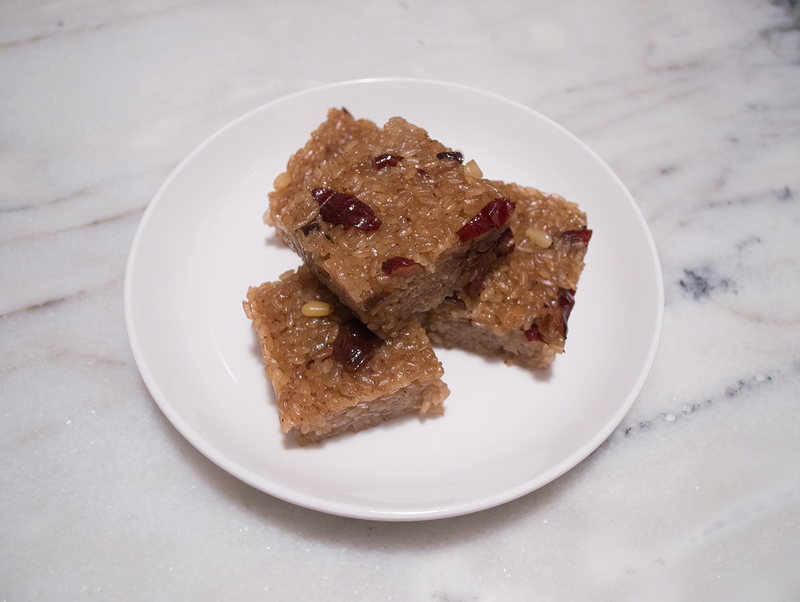 Nowadays, you see variations of yaksik, with a combination of honey, white sugar, brown sugar, and maltose. Croustillant isn’t an essential item in making choux pastries; however, it delights many gourmands when there’s a streusel-like cookie topping to enhance an airy pastry like a cream puff. The crunchy-crackly shell it creates makes for a better mouthfeel. 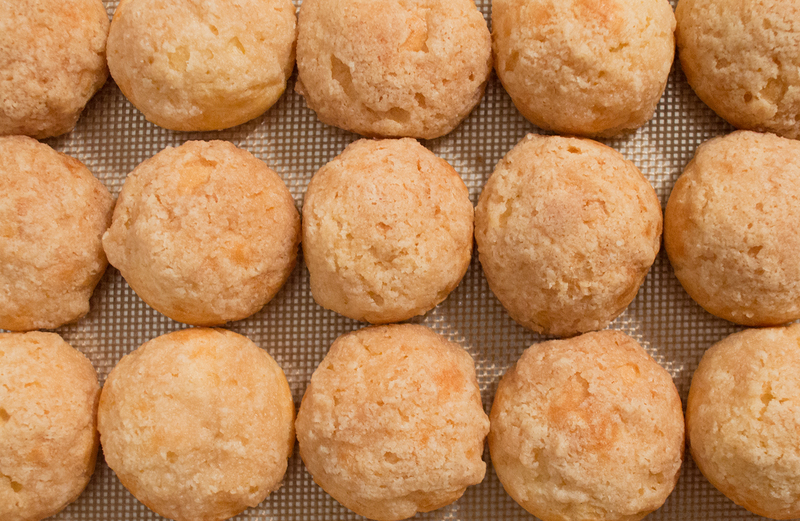 Plus, it extends the shelf-life of a pastry by slowing down the softening of a choux shell. Our Korea trip continues on! We went to the must-see area of Dongdaemun, so the following morning, we set out to see Namdaemun, the market around the Southern gate. 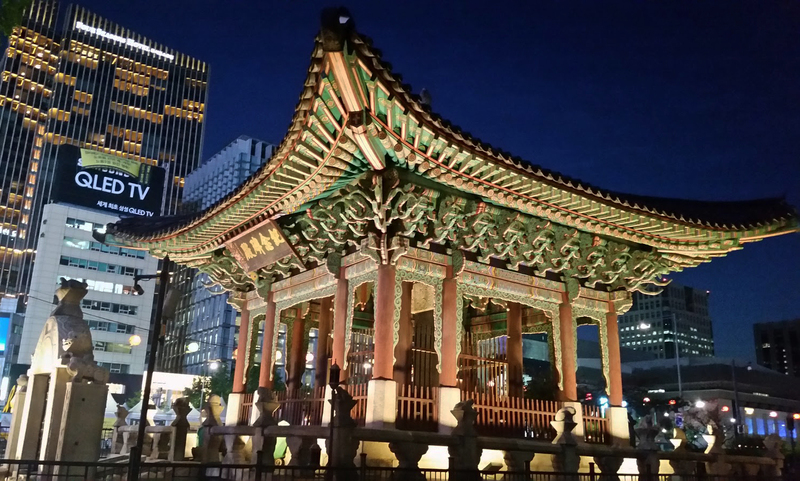 A few weeks ago, we began writing about our adventure in Korea! We really enjoyed our time on Ganghwa Island, visiting the farmer’s market and seeing what my aunt and uncle were growing on the family farm. 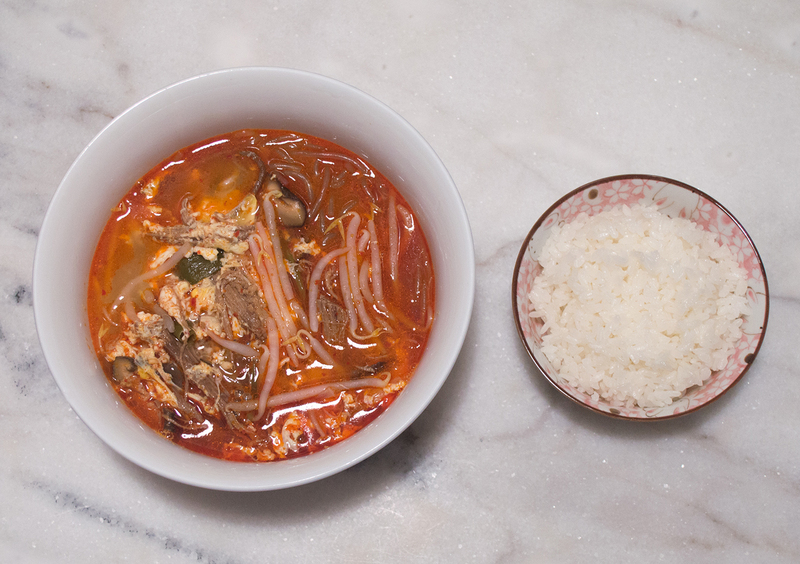 I made them yukgaejang, a spicy beef brisket soup, before leaving for Bucheon. Fondant is a kind of icing, often used to decorate cakes and pastries, and fill chocolates. There are two versions of fondant: rolled and poured. The rolled version is mostly used for layered cakes, putting a smooth blanket cover over frosted layers of sponge. It’s malleable, allowing a decorator to create figures and shapes for cake toppers. 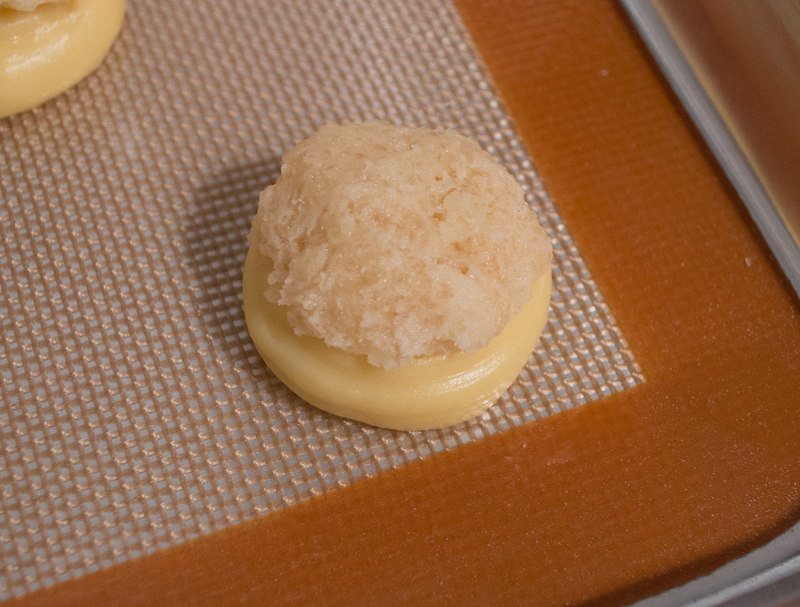 The poured version is used to cover petit fours and choux pastries, and fill various confections. Crème Pâtissière is a base component for pretty much anything we wanted to fill. Pastry cream is excellent in fresh fruit tarts, varieties of choux, millefeuille, and breads. You can also find them inside desserts like Boston Cream Pie. It’s versatile, in that you can turn the cream into whatever flavor you want! Hey, everybunny! It’s been over a month since I’ve posted, so it’s about time for an update! Kitty and I came back from a two-week trip to Korea! It was really great to see my relatives and explore around Seoul. Immediately after we got back, one of my dearest cousins decided to visit New York City, and I’ve been a bit preoccupied in showing her around. I’ve finally had the chance to shuffle through hundred of photos from the trip, and I wanted to share with you what we ate, saw, and enjoyed during our time there! Here is our first week of our adventure! 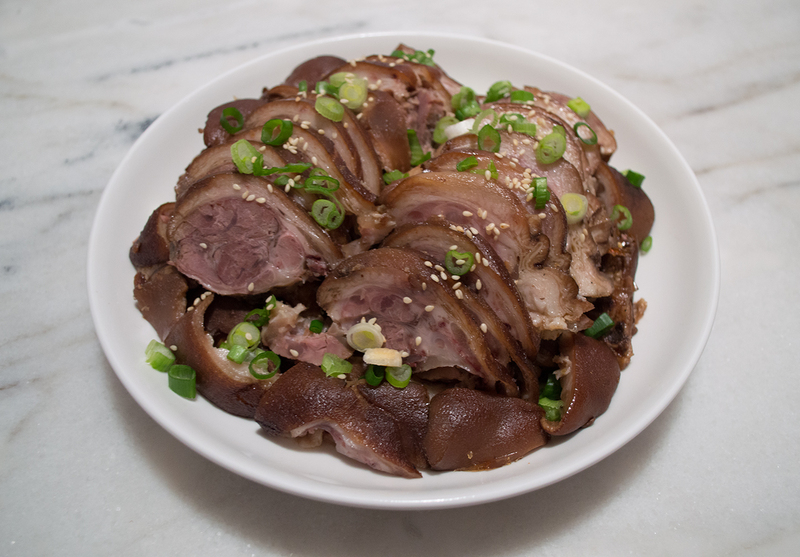 Jokbal (족발) is a braised pork dish that many Koreans love to eat. Most people go out to a restaurant to eat jokbal (족 – feet), but I always wondered how I could make this at home. I asked my mom, and then I set out to do some research. After digging around on the internet and looking through some cookbooks, I felt good about the ingredients I chose for this recipe, and decided to give it a go! 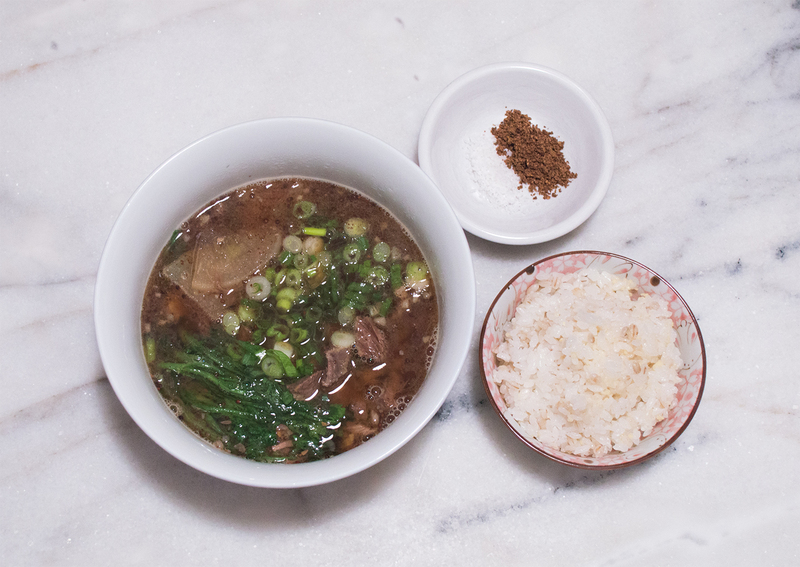 Much like saeujeot, ssamjang is equally important in bringing bo ssam (보쌈 – simmered pork belly, or other cuts of pork, wrapped with lettuce) and jokbal (족발 – braised pork trotters) together. I call it the happy trinity: shrimp sauce, wrap sauce, and lettuce wraps! Each of these components bring you that much closer to having a delicious dinner with your protein of choice! 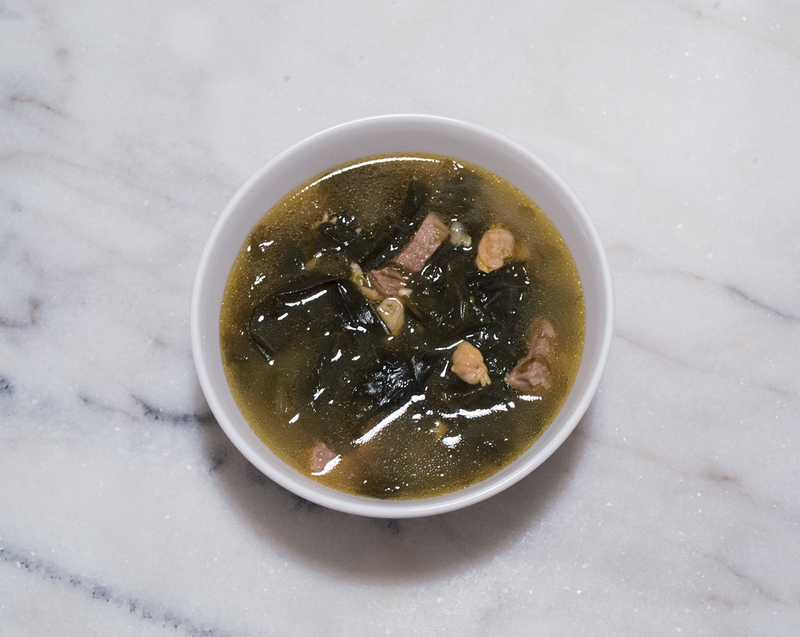 Seaweed Soup. It is the quintessential dish for Koreans to have on their birthday. I make Miyeok Guk (미역국) for my hubby whenever I can, but always remember to make this in February for his birthday. Rich in nutrients, seaweed is associated to mothers and their need for these vitamins and minerals. We often eat this on the morning of our birthday, to celebrate, but more in thanks to our mothers that birthed and took care of us. Exactly a week-and-a-half ago, we celebrated my dad’s birthday. To remember him and observe his life with us, I wanted to share with you one of my dad’s favorite dishes! I remember that he would *always* get Yukgaejang when it’s on a menu at a Korean restaurant. 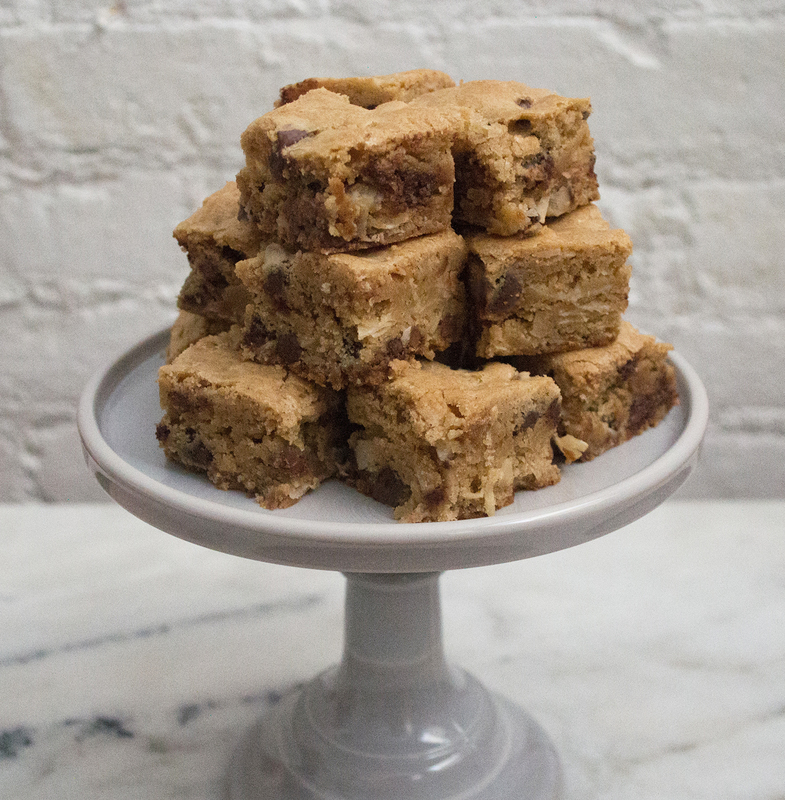 When brownies are too much chocolate, I make a batch of blondies! The sweet, rich, and chewy texture is still there, but I’m not being bombarded with a ton of chocolate. Don’t get me wrong, I love brownies too (less cake, more fudge); though there is definitely room for a piece of blondie on my plate, especially when Valrhona chocolate is involved! 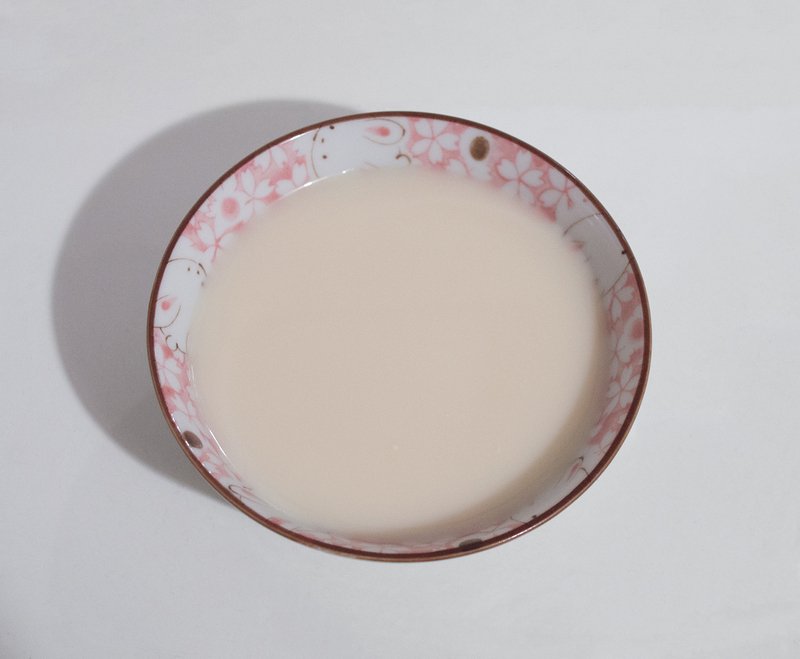 Sujeonggwa (수정과) is a Korean drink, traditionally enjoyed on special occasions! It’s also a great digestive tonic after having a hearty meal. 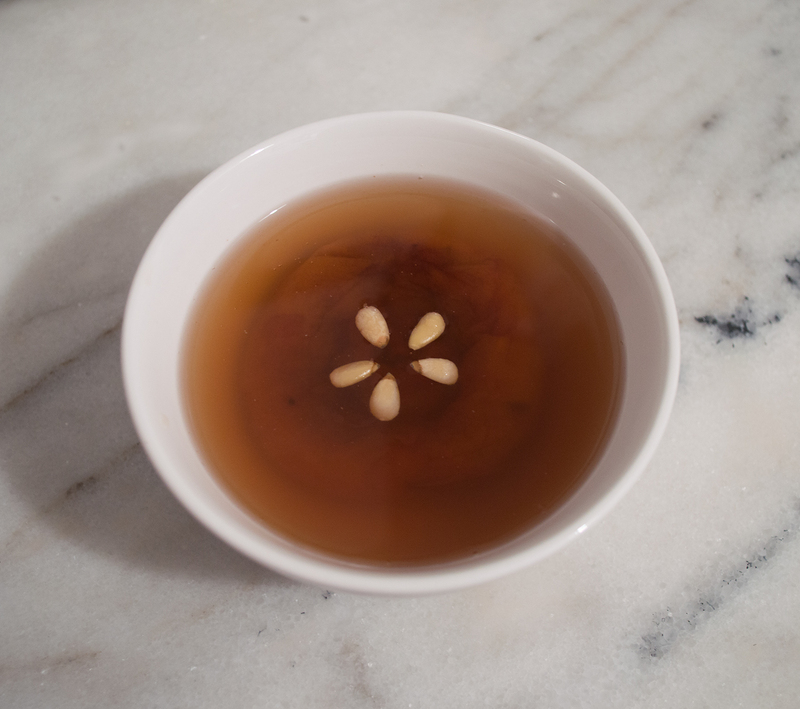 Lunar New Year is coming up at the end of this week, and I have this excellent punch recipe to share with you! 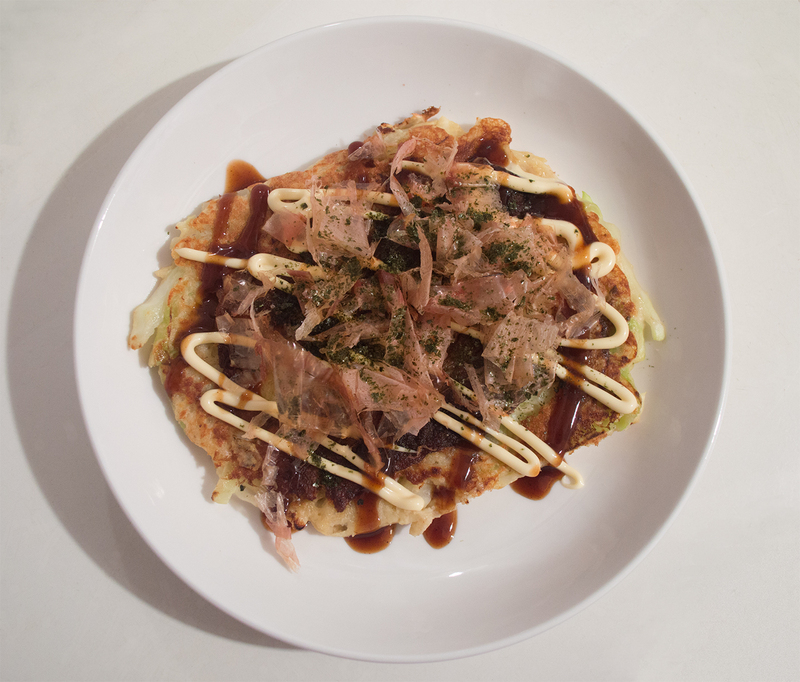 Okonomiyaki (お好み焼き) is a savory Japanese pancake, mainly consisting of cabbage and nagaimo, also called Chinese yam. After many years of tinkering with our Okonomiyaki recipe, Kitty created this as our set method in making these delicious Japanese pancakes! Hey everyone! It has been two months since I posted, and it has taken me some time to organize my thoughts and emotions over the course of these eight weeks. I haven’t forgotten about you guys, I just needed to spend time with my family after the sudden departure of my dad. He passed away in early November. 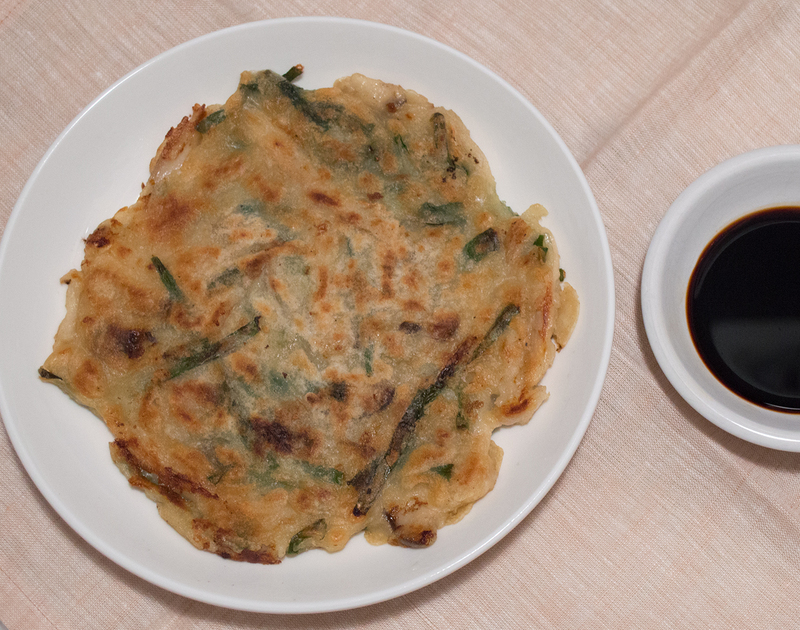 Now, this Seolleongtang (설렁탕) is a labor of love, but you’ll be completely satisfied when it’s all done! It’s getting colder here in New York, and Kitty and I have been searching for some excellent soup. It’s nice to have a delicious hot meal when you have been running around town the whole day, battling the wind chill through the concrete jungle.